I knew almost nothing about Grace when I stepped in. 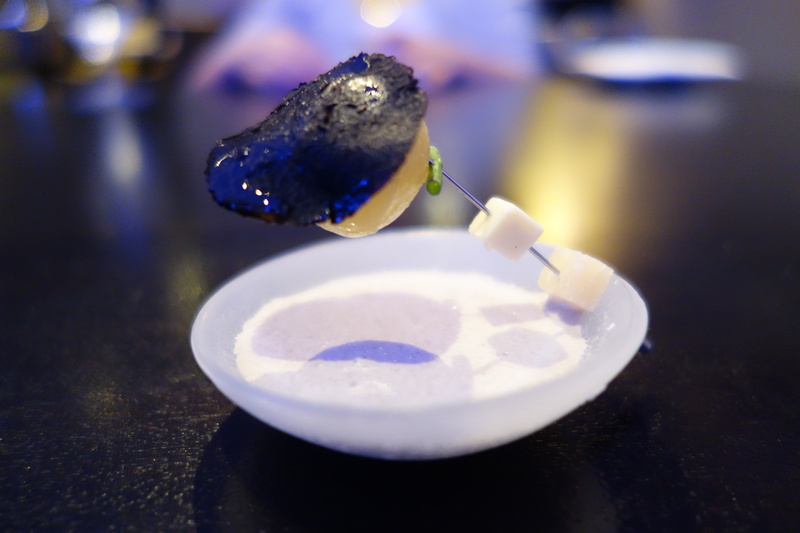 I only knew that in the year that they were open since December 2011, Grace has had a meteoric rise, garnering two Michelin stars immediately. 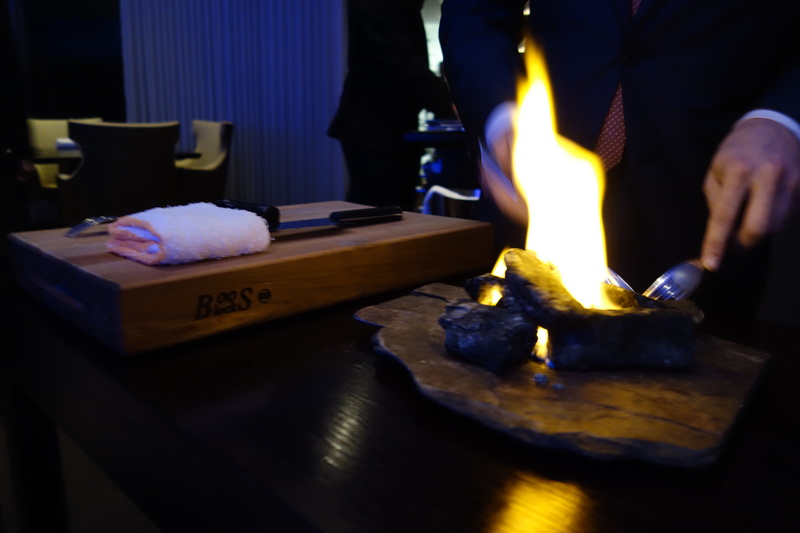 This is the restaurant that Chicago expects to be its newest 3-star Michelin restaurant. 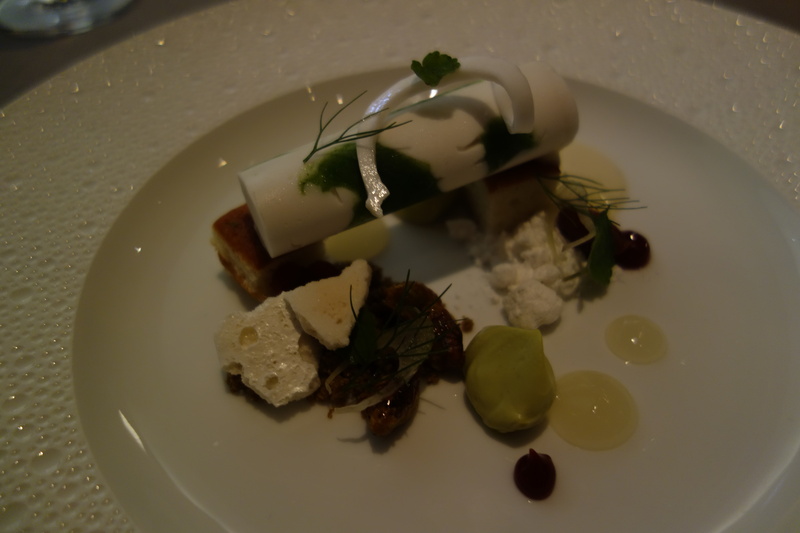 Some people have called it “Chicago’s per se”. I think that is a mistake. The dissimilarities with per se are much more striking than the similarities. Firstly, the plating of food. 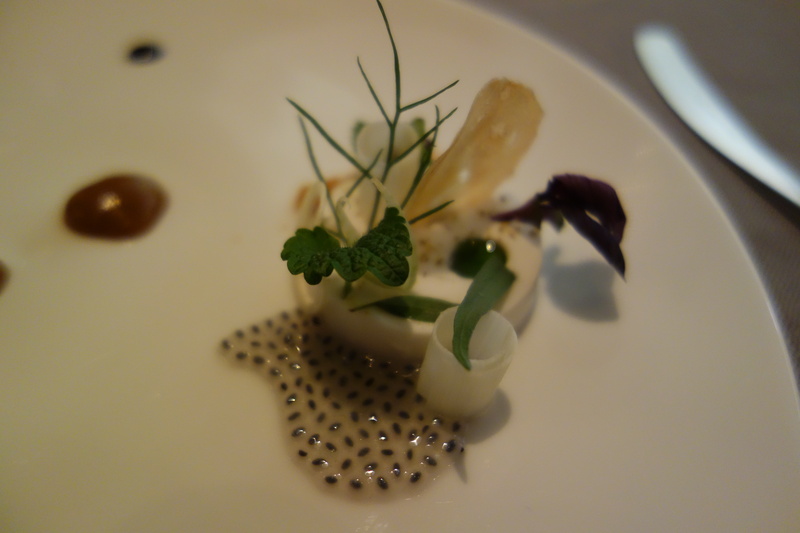 The plating at per se is a style one might call classical, putting the main ingredients front and centre. 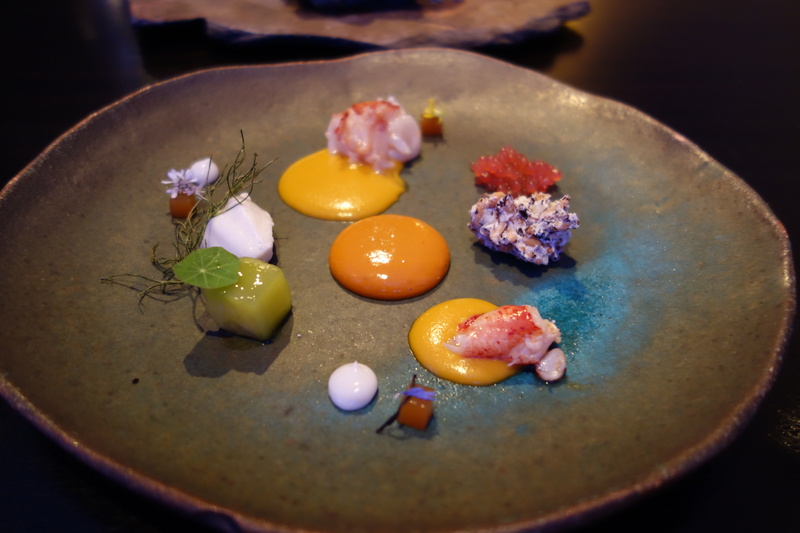 The plating style at Grace eschews that to put the ingredients by the side; in two piles; even three dimensionally (see the Alaskan king crab). 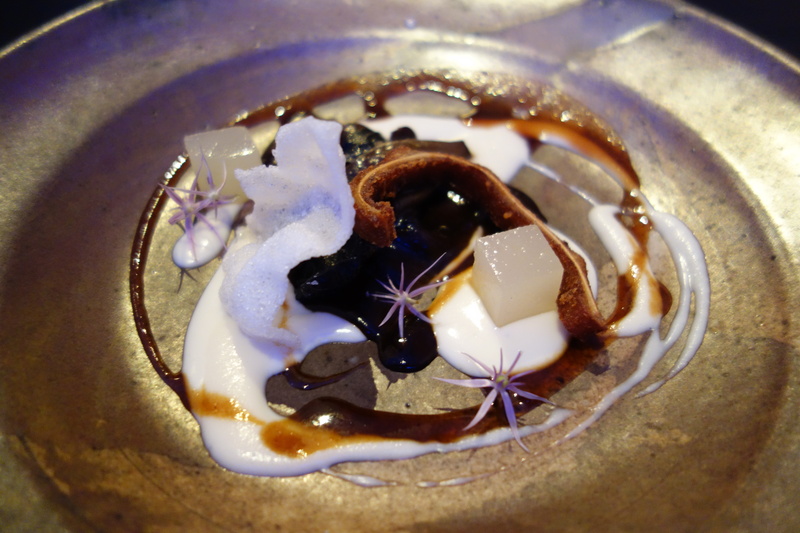 The plating has more in common with the chaos on view at Schwa. 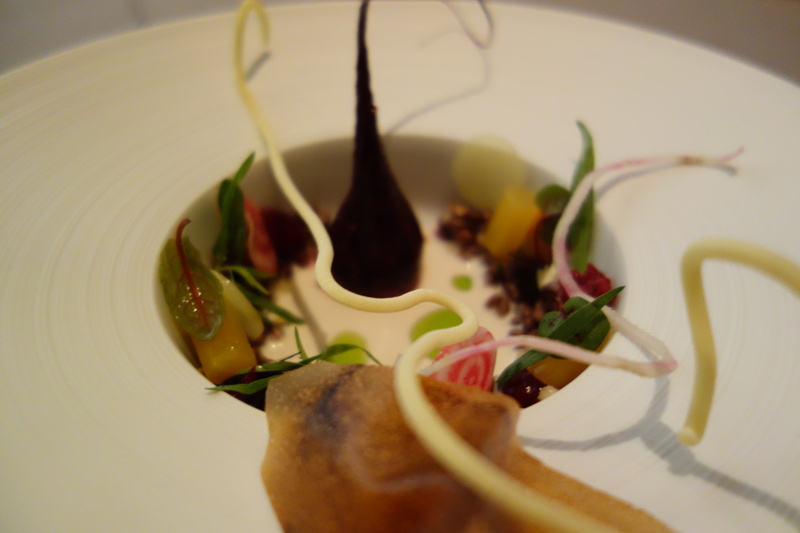 Secondly and more substantially on the flavours, make no mistake – Grace is exciting. 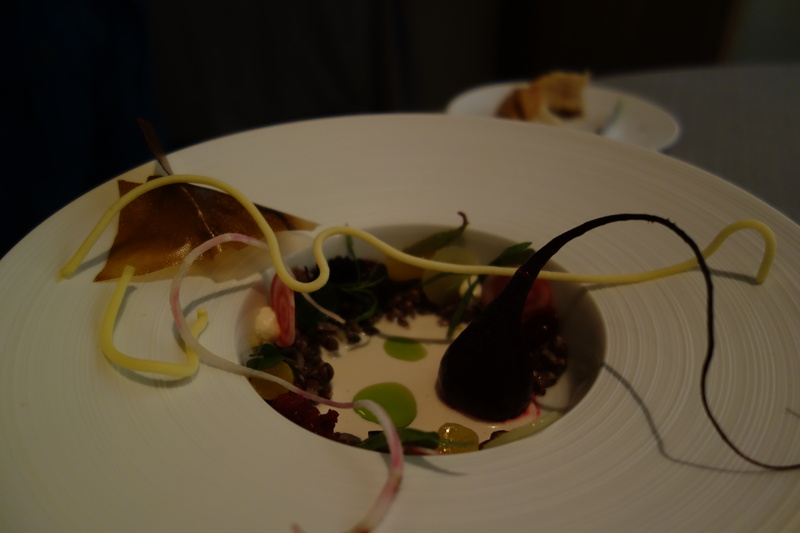 Licorice, in particular, played a part in 4-5 dishes across the 18 we tried across both Flora and Fauna menus. It was not uncommon to have up to 15 different ingredients in one dish, as the kitchen strived for a very precise effect. 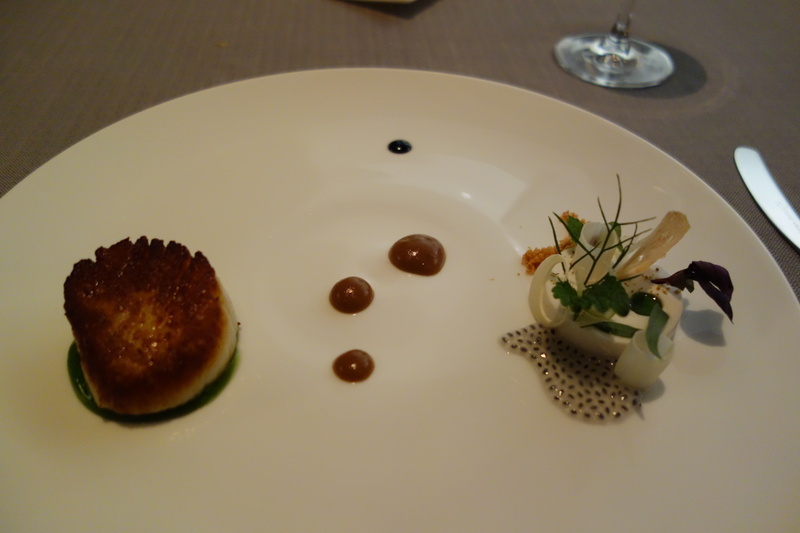 Some touches, with the onion in the perigord truffle custard, were sensational and subtle. 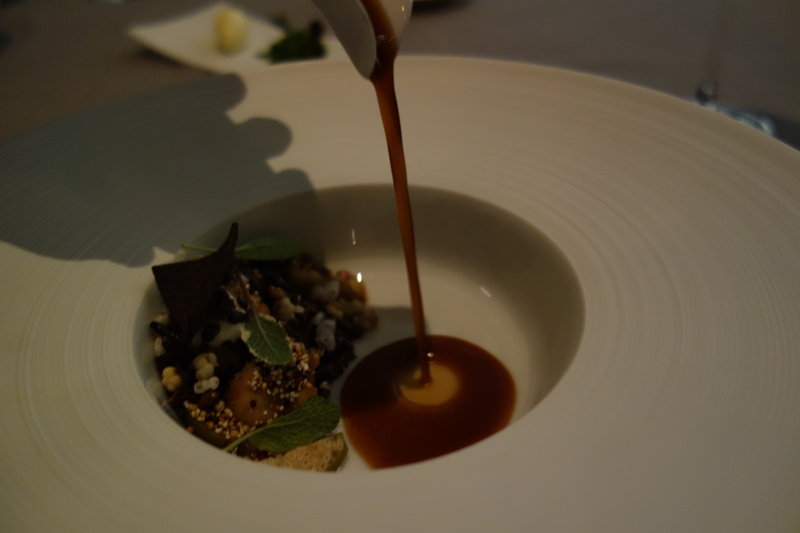 This paradox – baroque of taste and minimalist of plate – is what drives Grace forward. As a diner, you have a choice between two menus. The Flora and the Fauna menu. The Fauna has the better mains. The Flora has (slightly) better desserts. Beware though: if you’re accustomed to having meat in some measure on your menus, you will likely be dissatisfied with Flora mains, which are much more intellectual-exercise than delicious-plate (a problem I had with vegetarian Kajitsu in New York as well). Strangely, the Flora menu isn’t vegetarian by default, I guess some animal products still find its way into the sauces. Most people, faced with this conundrum, order different menus across the table, so that everyone can try a bit. All kinds of herbs find their way onto both menus, and many of them hail from Asia. 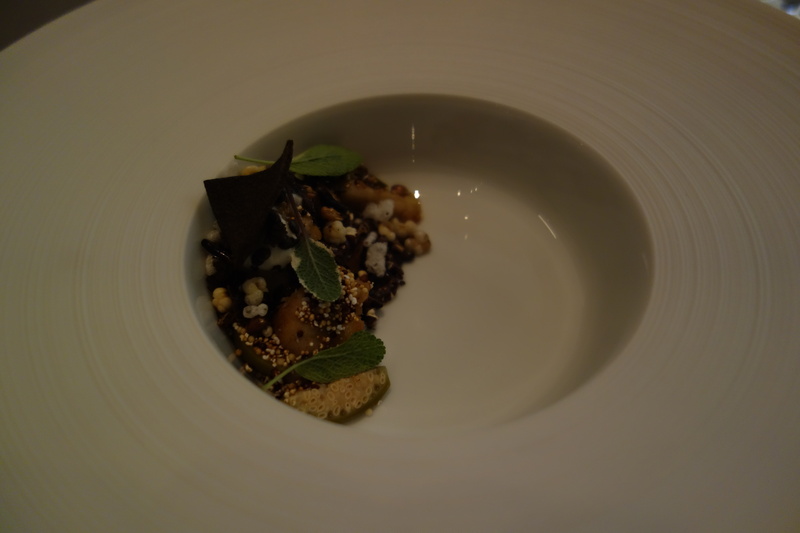 A Indian tamarind named kokum, Vietnamese herbs, bold use of licorice: at times it almost seems as if each dish was constructed around a single herb (USUALLY EMPHASISED WITH ALL CAPS). My overall verdict on the menus: each menu features very strong dishes, but they tend to alternate (the 2nd dish on Fauna, the 5th dish on Flora). 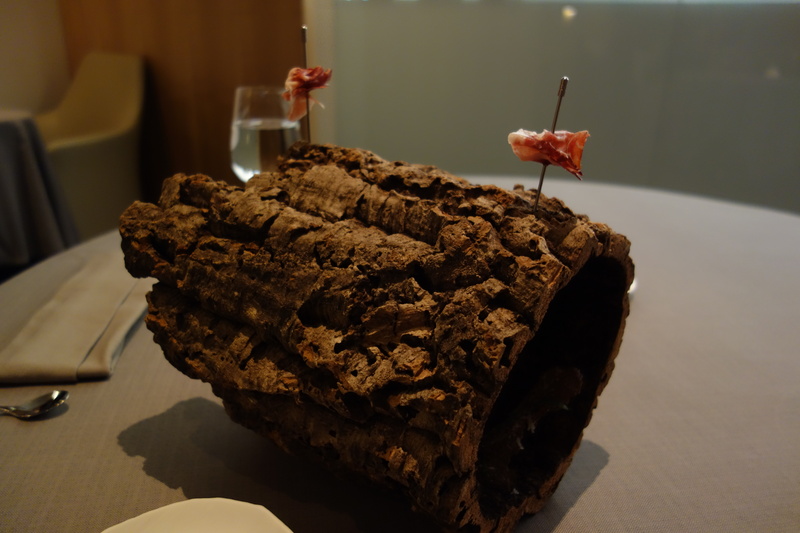 There is already a 3-star Michelin menu on the table, if we take the strongest dishes of both Flora and Fauna. The Fauna menu was the one served to me, and so apologies if my descriptions or recollections of the Flora menu are patchy. Grace’s dining room is a classy muted bronze in colour. No natural light seeps in, except a brightly-lit kitchen sealed it by glass at the very head of the room. It is the open-kitchen concept that is all the rage today. Both of us were seated facing the kitchen, the metaphor of dining as theatre made explicit. 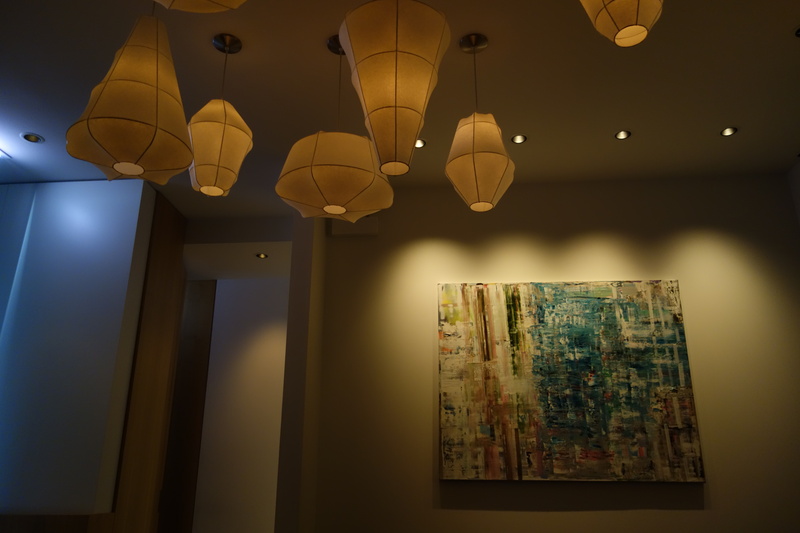 Grace certainly has all the trappings and food to merit a 3-star rating (if the best of both menus are combined). I would be surprised if it doesn’t make it within a couple of years. So the plateware, Curtis decided, should act as more than serving vessels and actually enhance the taste of a dish, even if just in the mind. 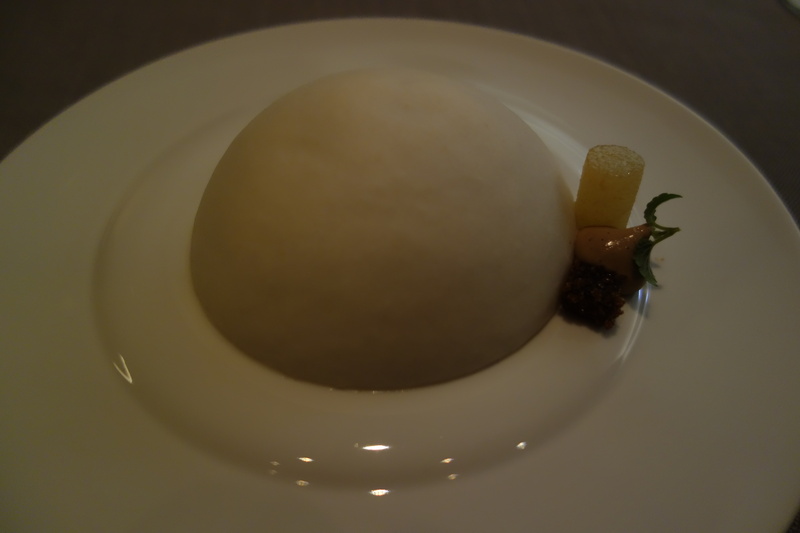 A chestnut puree’s creamy texture might be accentuated, he reasoned, if it was served in a bowl with no edges. He ordered curved bowls from France that resembled overinflated inner tubes. Quinoa chips, a lemon cup of intensely-lemon-scented(incl. 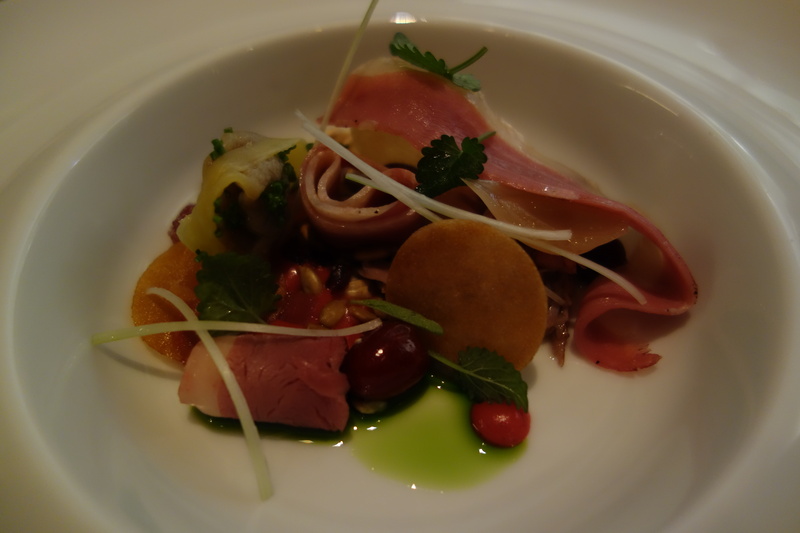 zest and all) cold risotto, candied pineapple, ham with the slight taste of ginseng. 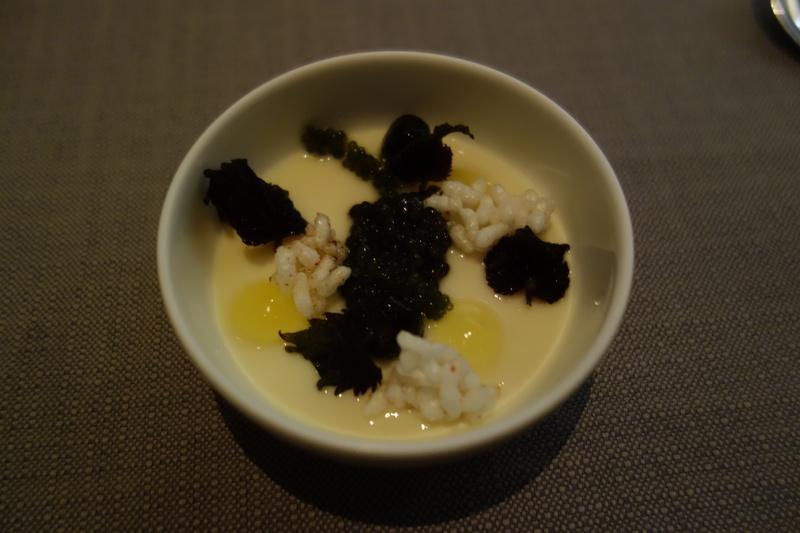 Chewy “bubble tea” balls in a ham-flavored chawanmushi, with puffed rice, a sprig of seagrapes. Osetra caviar at the center. A tremendous dish. This dish alone was worth the entrance fee. 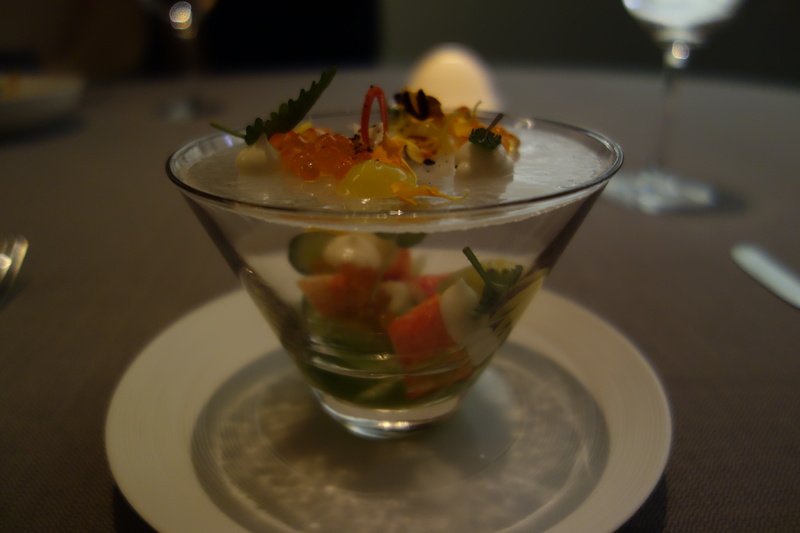 King crab and small cubes of cucumber sit at the bottom of the bowl, with calamansi (a particularly tangy and acidic Southeast Asian lime) juice surrounding. 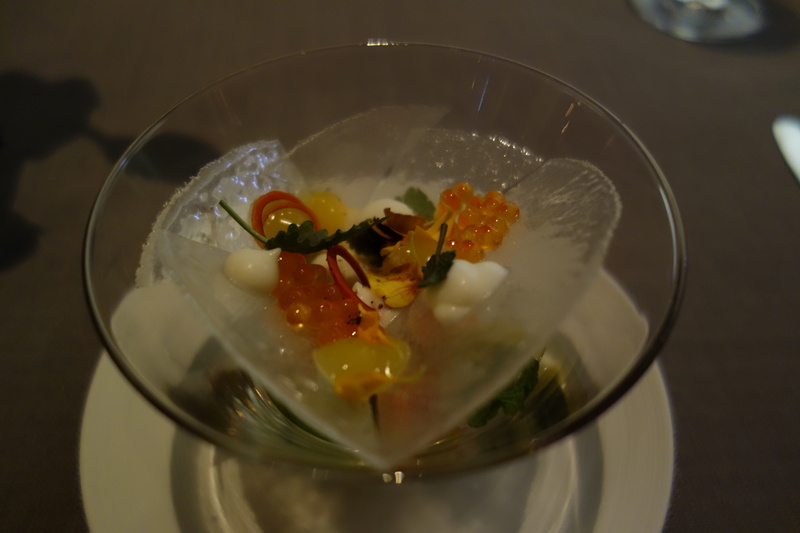 A neutral sugar glass holds up the upper deck of ingredients, the including trout roe. 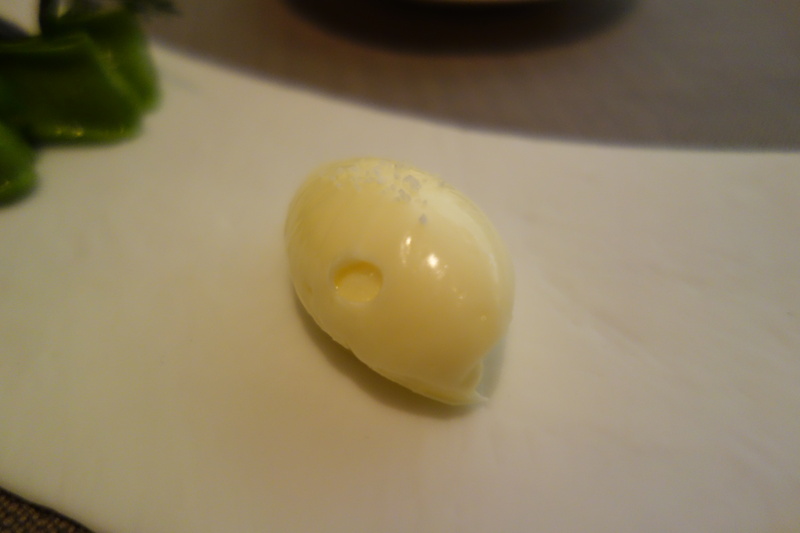 To begin the dish, I smashed the upper deck into the lower deck with a spoon. It was all you could have asked from a dish, in both taste and effect. In the effects department: it had 3-dimensionality, interactivity (diner plays the chef), and time-sensitivity. 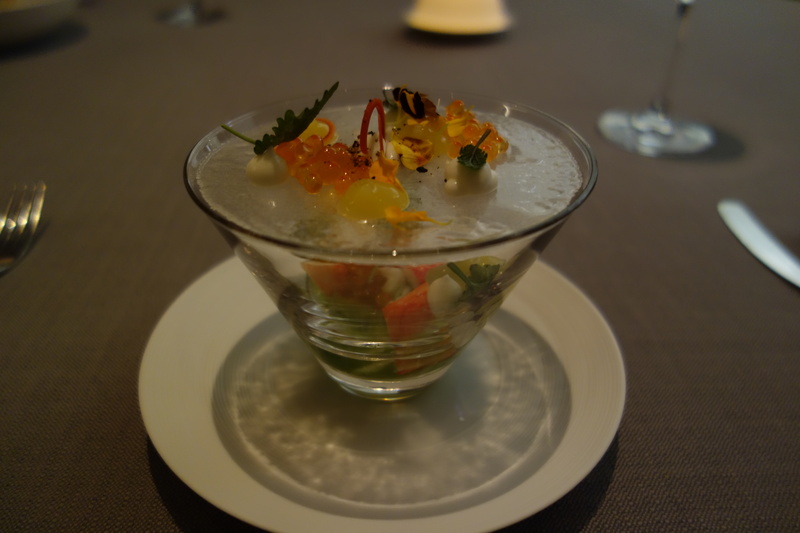 In the taste department, the meaty flavor of king crab was contrasted the small neutral refreshing taste of cucumber, and the sourness of the lime, transformed by the dissolving sugar glass into a dessert-like thin calamansi sauce. 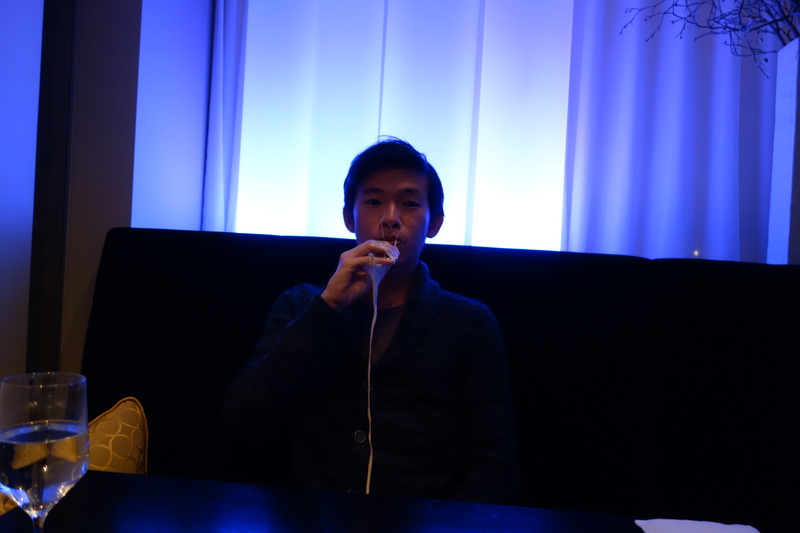 The sugar glass was just the right thickness, not too sharp and easily dissolved in the mouth. This dish will haunt my dreams for a long time. 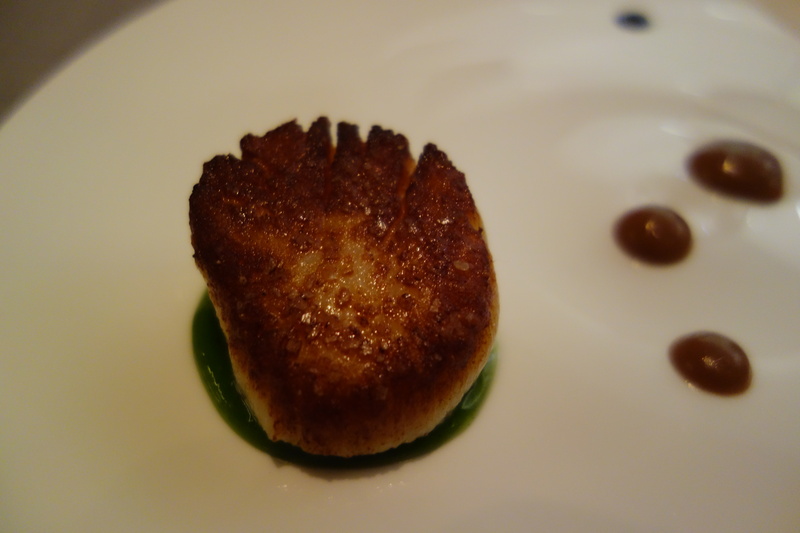 A whole Maine scallop from Desert Island, with licorice and anise hyssop purees. A coconut custard by the side. 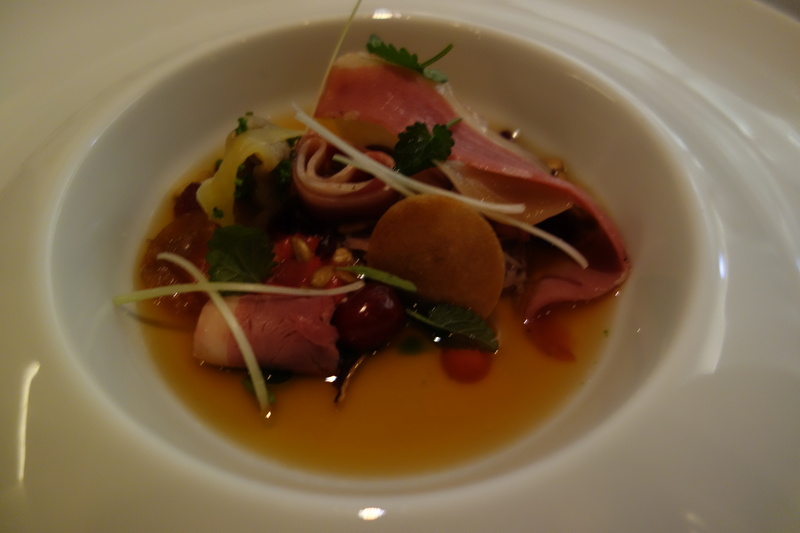 A duck confit tortellini, with cranberry and an intensely flavored duck-consomme. 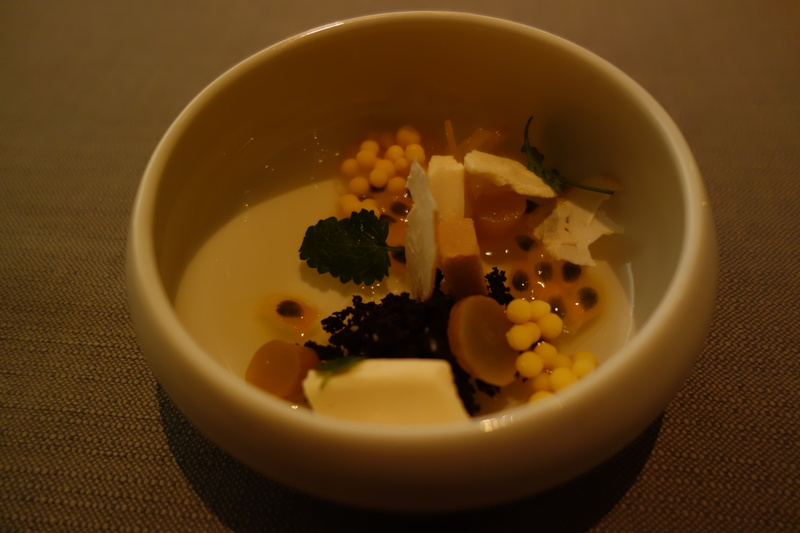 This was a very complex dish, and everywhere I scooped with my spoon there was new bit of sweet solid stuff which I could not place. Tastes of lemongrass permeated the dish. Perfectly fried sweetbreads, resting in a pile of multigrain, in a rich jus. Another amazing dish of the night. 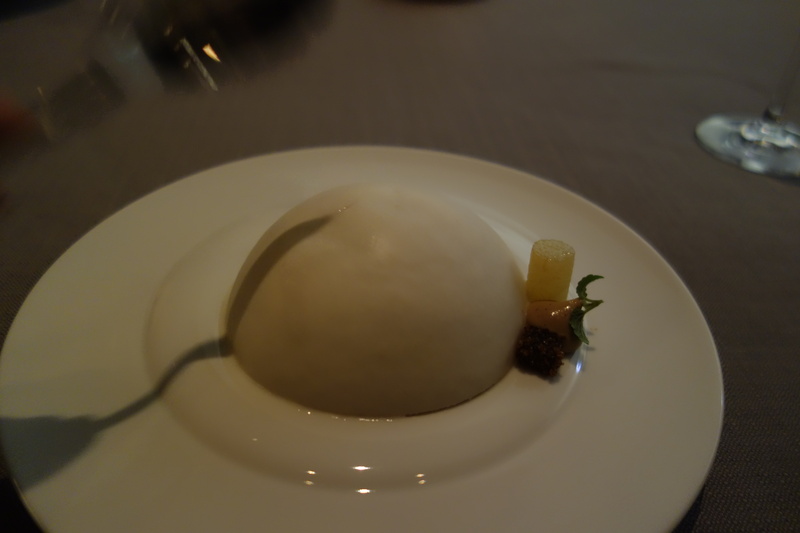 Shaved truffle – still retaining all its crunch unlike some that can taste like cardboard – is put on top of a custard that has the taste of sherry, with caramelised chipolini onions. Little slices of brik (Turkish dough) scattered on top provide textural contrast. Superb. Decadent. 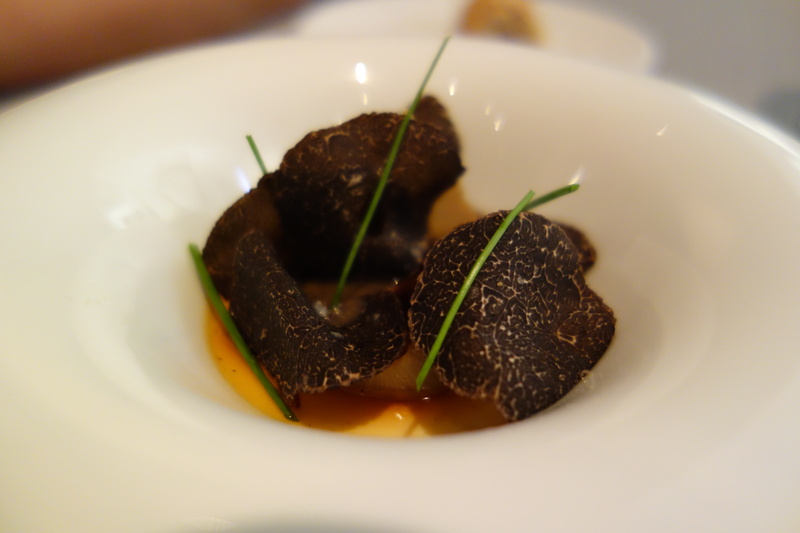 Sherry, custard, and the texture of fresh truffle. Divine. 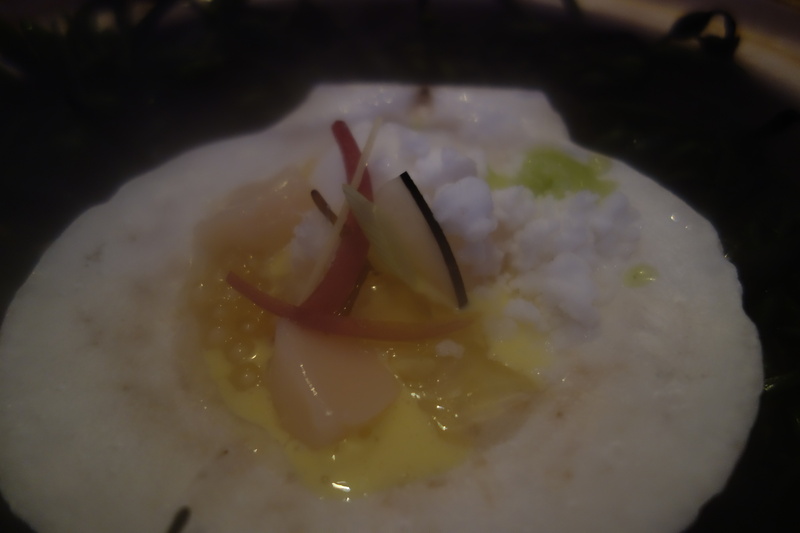 “The discovery of Miyazaki” is how this dish was described to me. 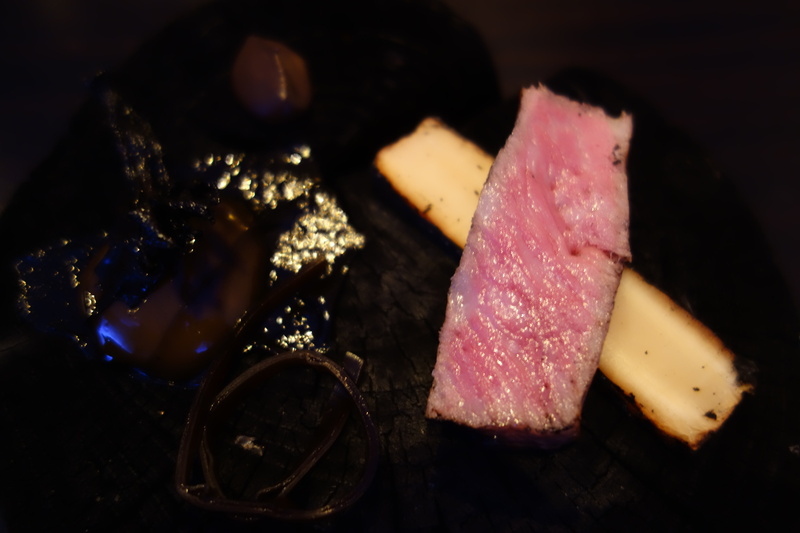 Miyazaki is perhaps the best beef in Japan, and the highest grade of wagyu. 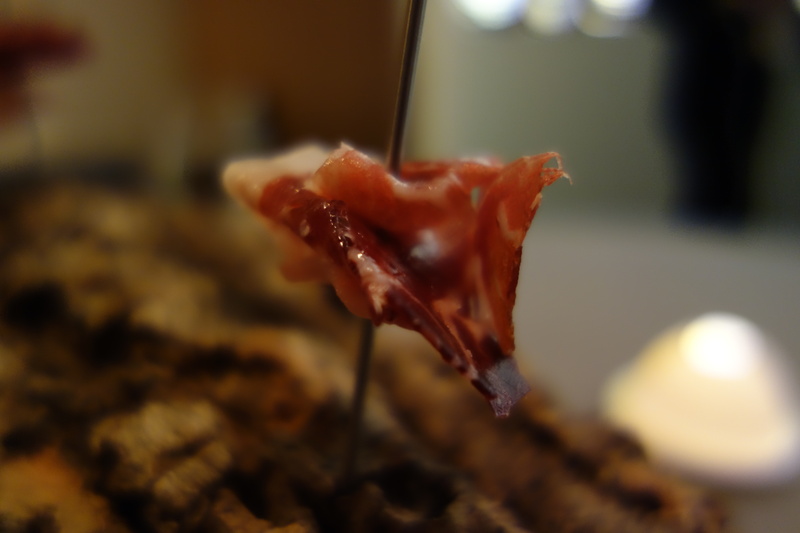 A slice of cured dreamy Miyazaki beef on top of a rice cracker, perfectly rare-cooked Miyazaki beef. Tender and full of fat. With something like fermented turnip undearneath, and various fresh, taut, Vietnamese herbs that evoked some of the street food I had in Saigon. 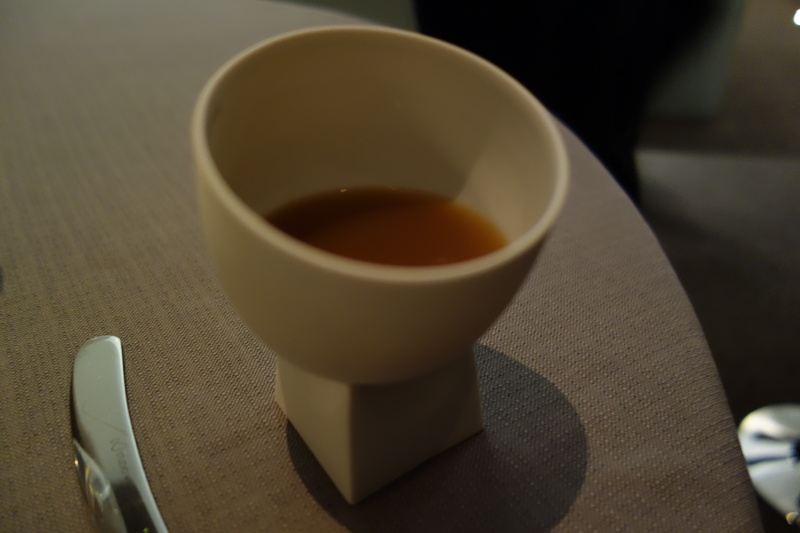 It was paired with a cup of tom yum broth. 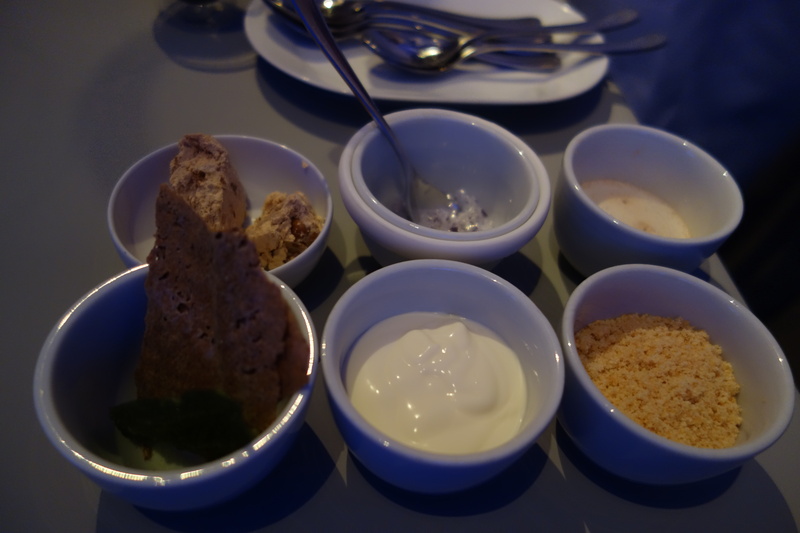 This had some of the best elements of Southeast Asian cooking: the Indochinese rice cracker, the Vietnamese herbs, the peanuts and tom yum evoking Thailand. Tremendous. 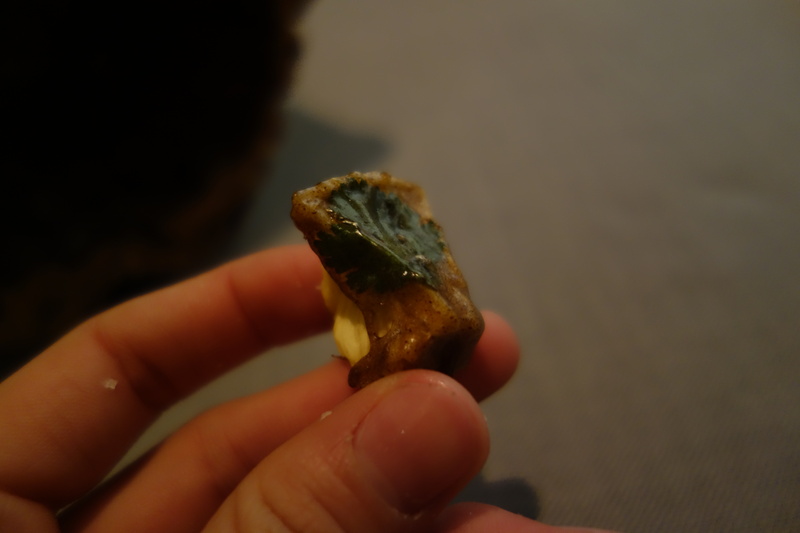 I ate my Miyazaki beef using my rice cracker as a taco. Possibly the most expensive taco I’ve had to date. 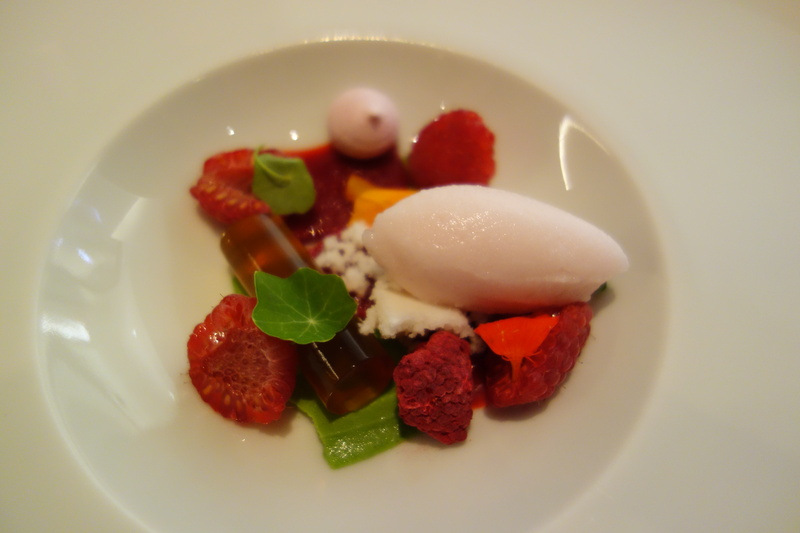 A dessert building on the Ispahan-esque base (also see, Restaurant Andre’s version) – raspberry, lychee, strawberry substituting for rose. 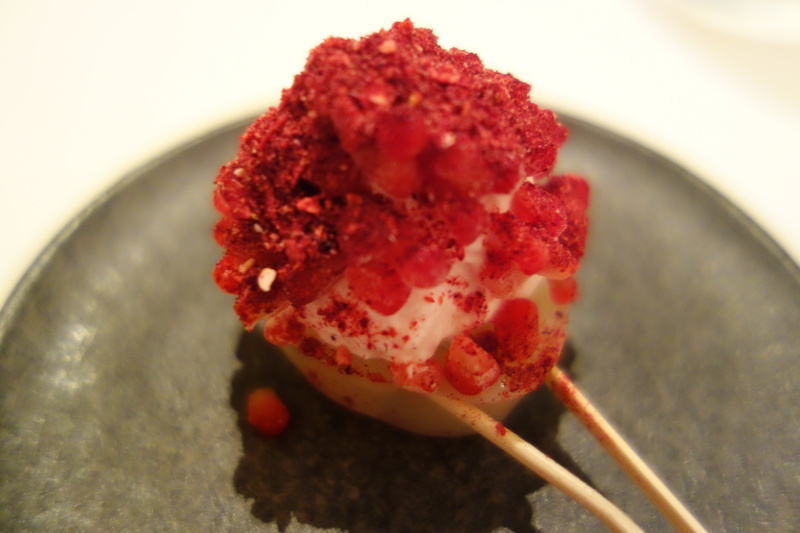 Strawberry sorbet, dehydrated raspberries, dehydrated lychee. 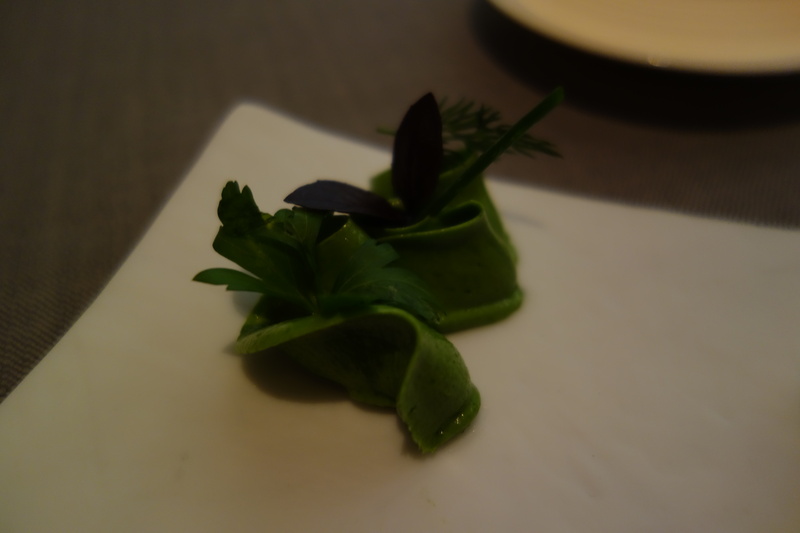 The 4th and 5th wheels were a cylinder of earl grey (one of the trendy tastes in Chicago – I had it all three nights in a row at Schwa + Alinea + Grace) and kokum puree, from an Indian tamarind. Another good dessert. 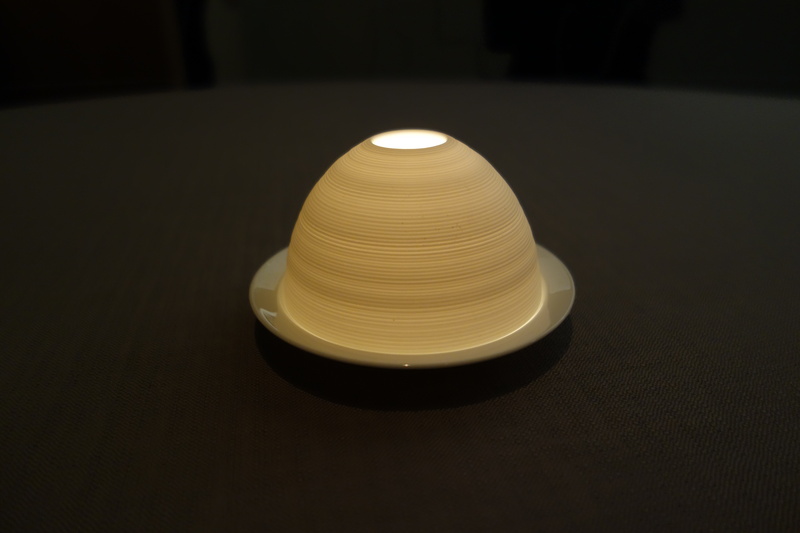 A dome of (white chocolate?) 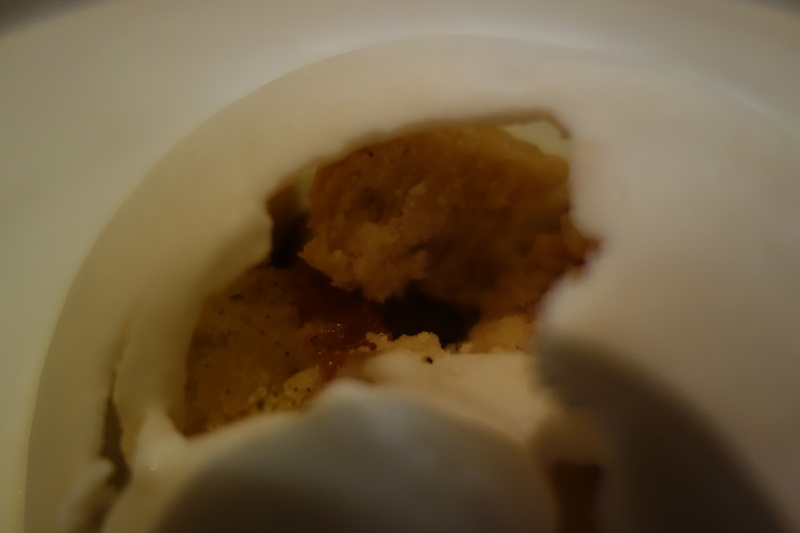 covers licorice-tinged financiers, and Asian pear ice-cream. 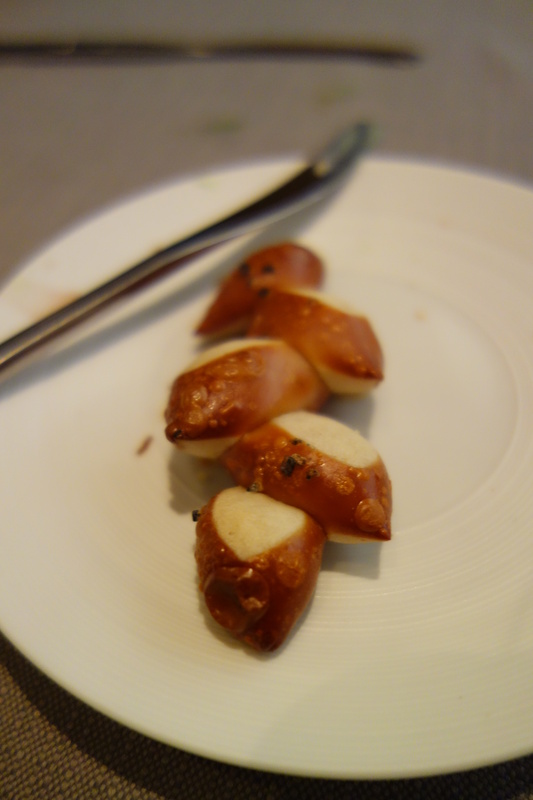 The licorice here was a star player, cutting through just pear and butter, and elevating the financiers. 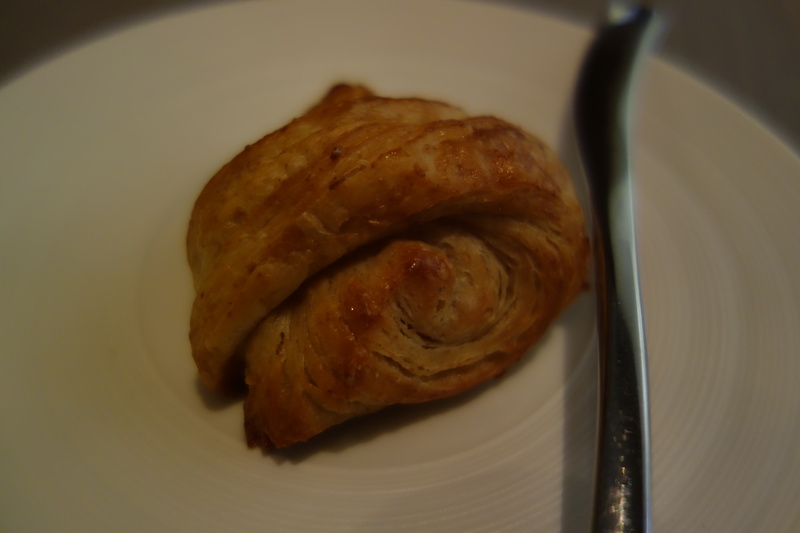 I found this a bit one-dimensional, with the starchy sweetness of medjool date overpowering the other ingredients. 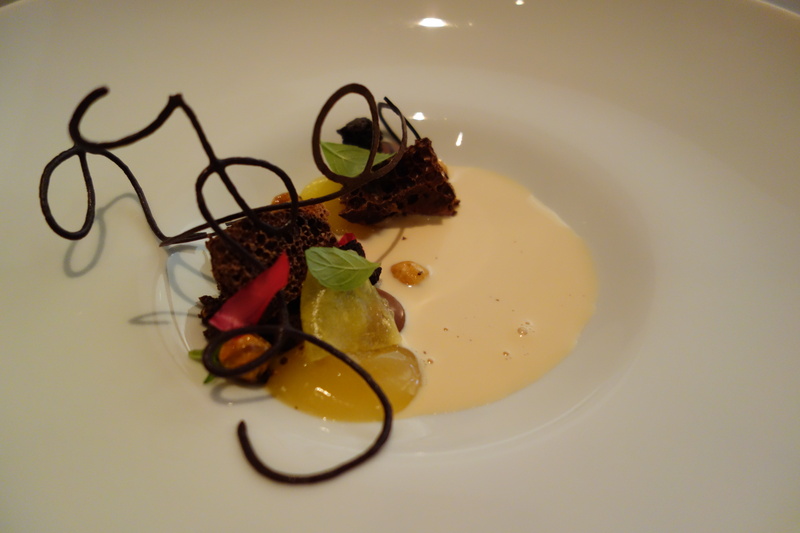 A rooibos-infused goats-milk, strong tasting, into a traditional preparation of chocolate-hazelnut and pineapple. 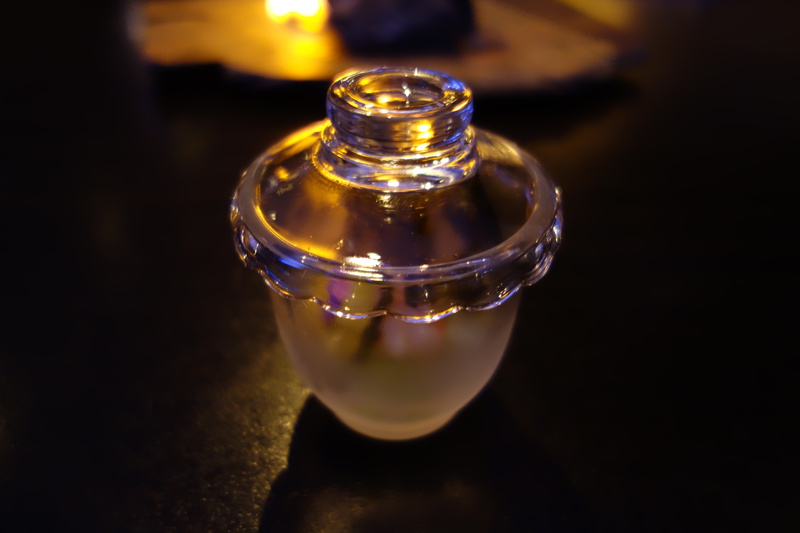 Amazing, I remember – a cylinder of young coconut pairing with a tart cherry. A cylinder of coconut meringue and pistachio gelato were good, but all it needed was that sensational squiggle of coconut with a tart cherry. 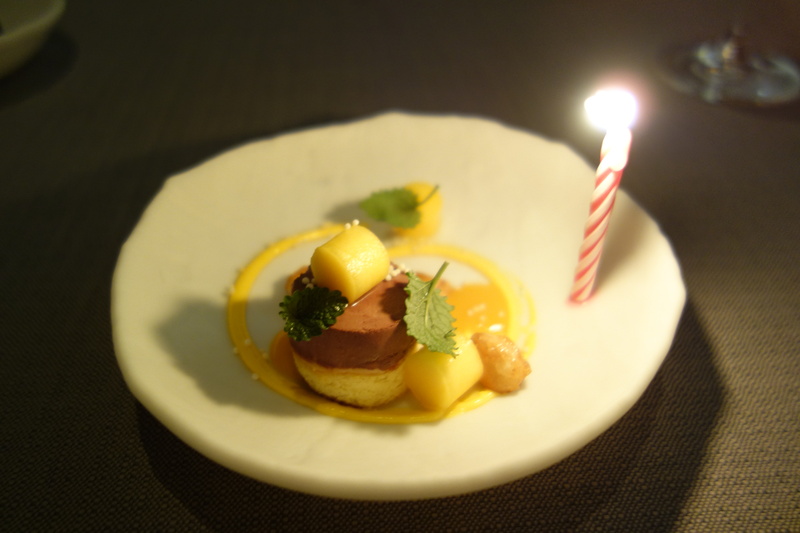 Chocolate ganache, with passionfruit. Mmm. 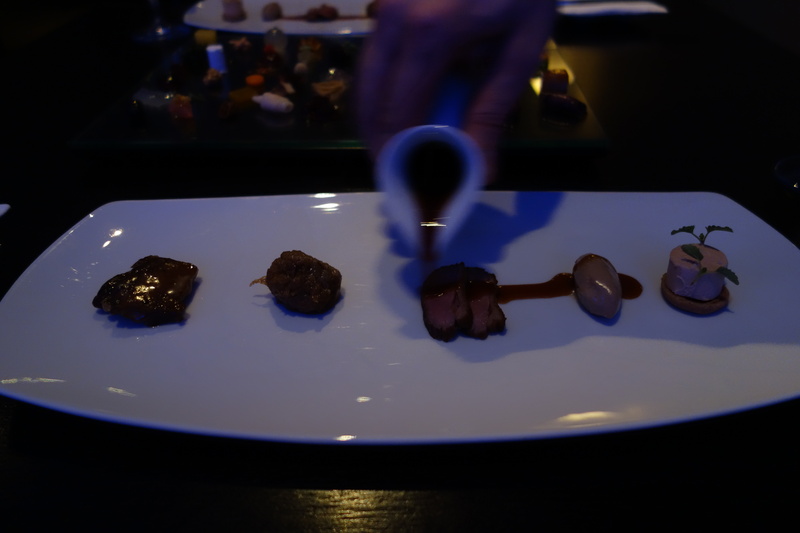 I had waited for two years to dine at Alinea. 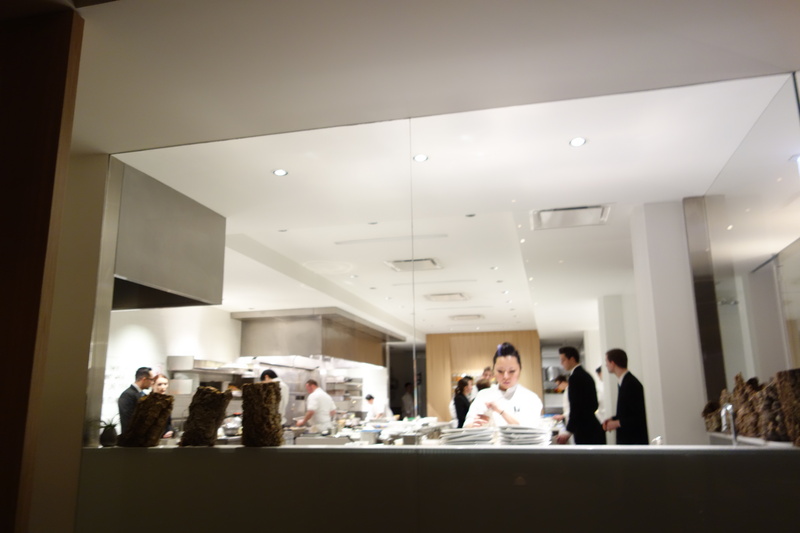 In 2012 I was denied the opportunity when Alinea suspended taking reservations for two months while they got their new ticketing system set up. 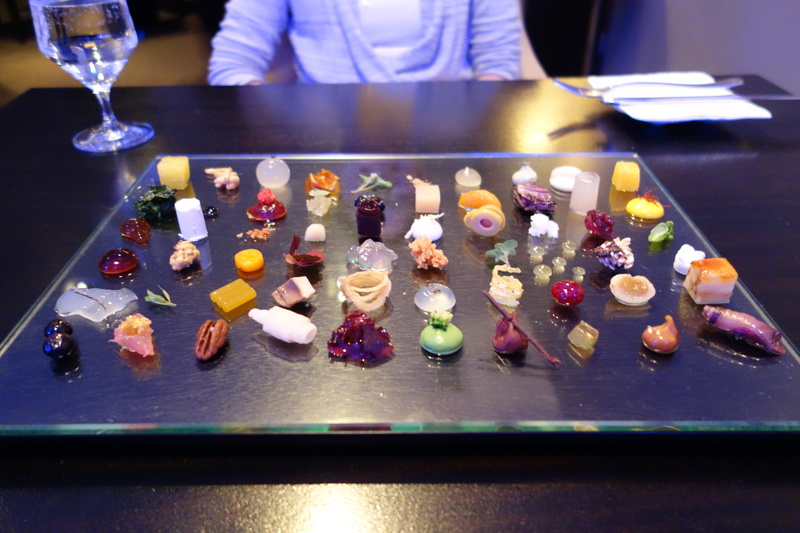 In 2013, I had set-up a virtual assistant to watch over Alinea cancellations for the one Wednesday I was back in Chicago (I did my math, about 75% of the time, a Wednesday 2-top or 4-top would be released), but it didn’t happen. But for my birthday, I managed to snag a 2-top for Friday way in advance. But perhaps I shouldn’t have bothered. What a disappointment. 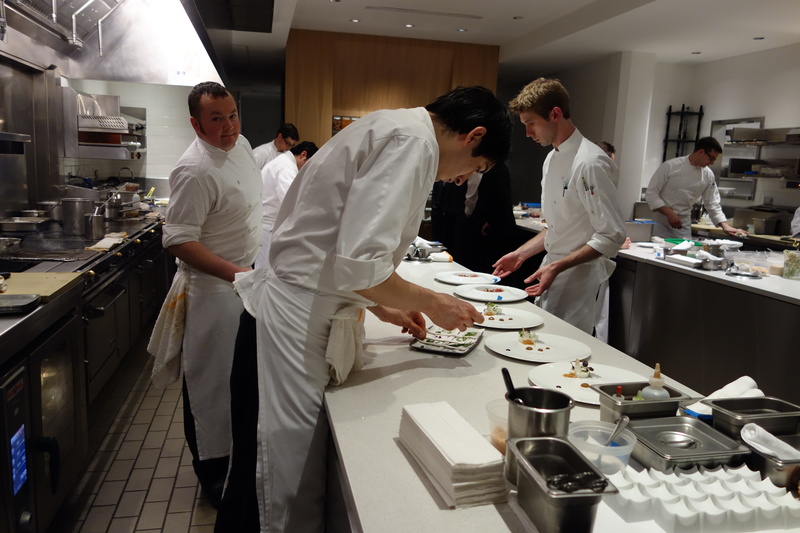 Firstly, the legendary meals lasting 4 hours, with 23 course extravaganzas are long over. 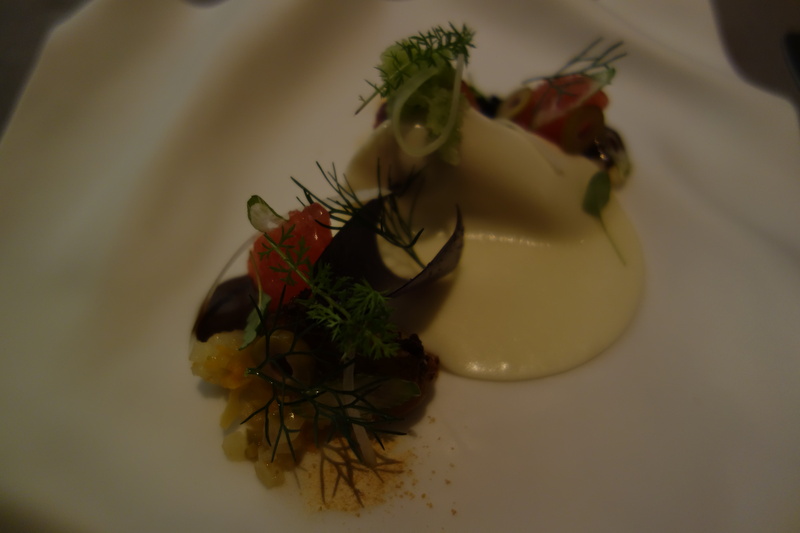 Alinea’s hey-day, it seems from browsing food posts on Chowhound and blogs, was 2005-2011. 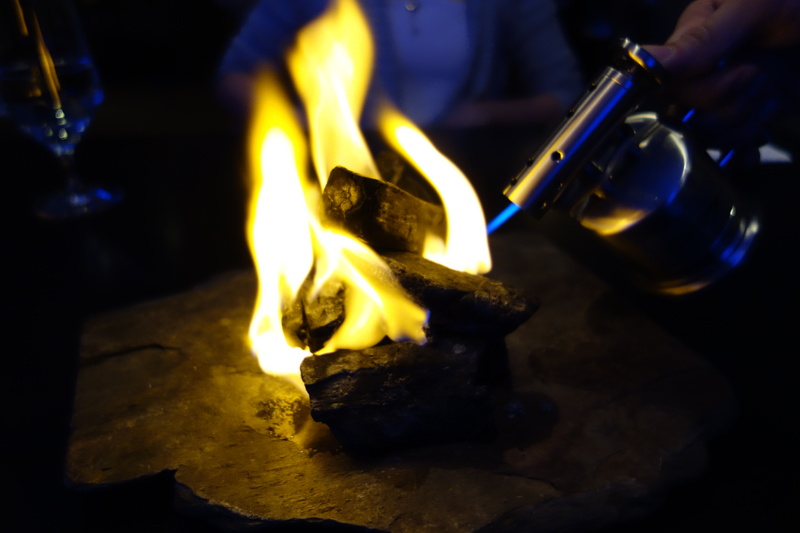 Alinea has streamlined down to 13 courses. (14 if you count the birthday surprise). But a by-product is that meals last about 2 hours, maybe 2.5 hours tops. 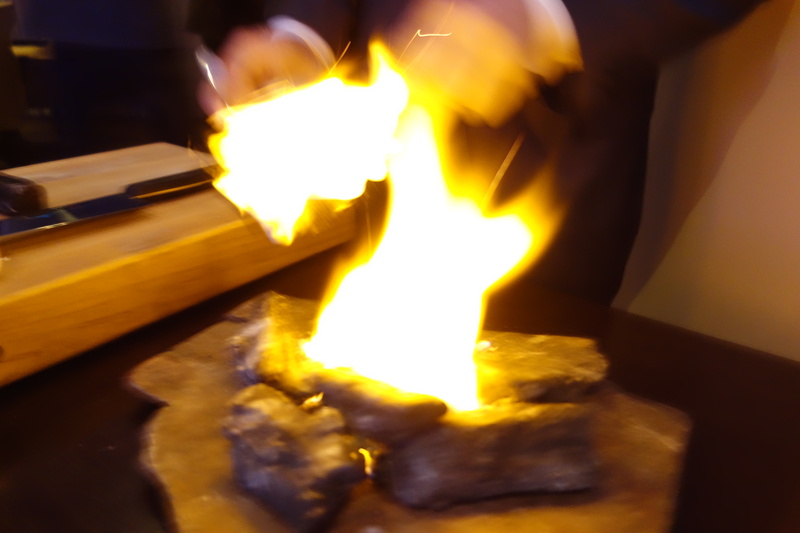 Considering that I had been royally entertained at Schwa for 3.5 hours the night before at half the cost of Alinea’s top-of-the-line price ($340 per pax), I felt I was just one more diner in a conveyor belt fine-dining experience. You come, and for two hours, are mildly entertained by a parade of Harry Potter dishes. Then you leave and another couple comes take your place. Encapsulating what I felt was the scene before me. 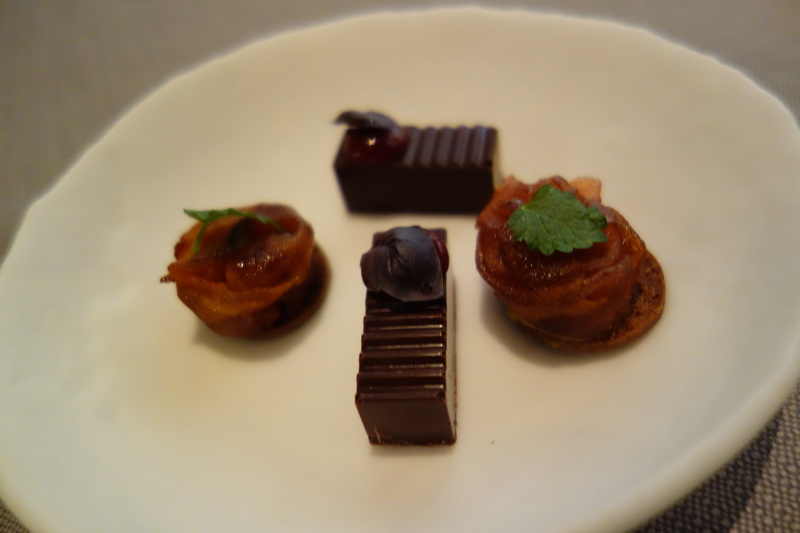 A couple from Pittsburgh (Alinea neophytes, like me) had flown in, and taken the wine pairing (probably at 530pm). 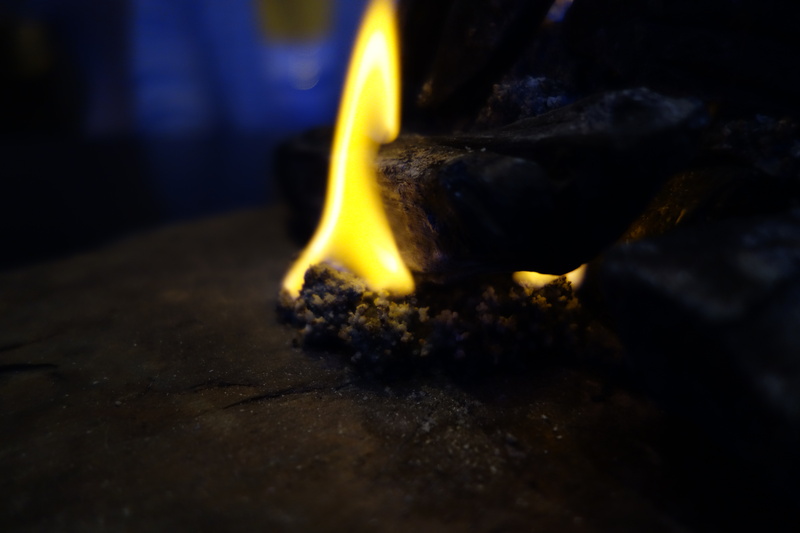 They were out by 730pm making gushing noises, and at 8pm another identical couple (Alinea neophytes, once again), had flown in, and taken their place at the same table. Quelle horreur! The thought occurred to me: what if this table was turned over three times a night, with 3 identikit mid-30s couples taking their seats again and again? Was this the theatre of the absurd, the Myth of Sisyphus incarnate? Certainly our servers, in serving the same tricks to the four occupied tables on the first floor, seemed to be afflicted by a peculiar type of whimsy without fun. 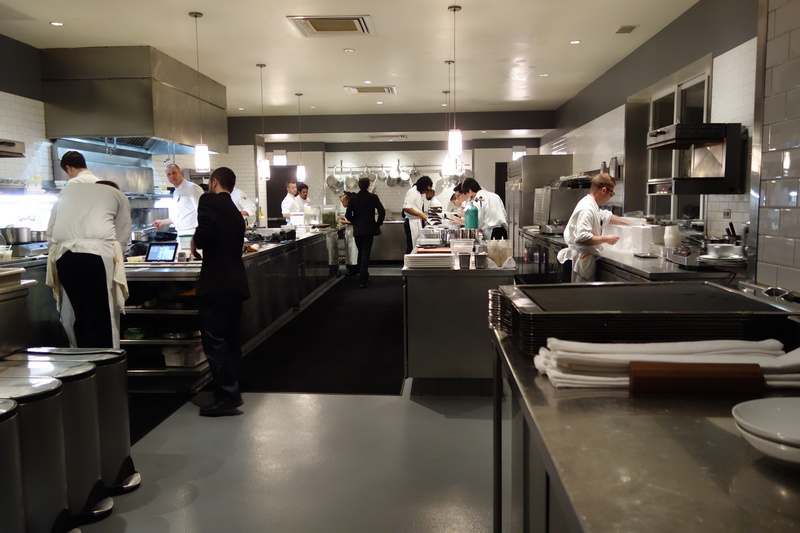 Secondly, the tables are too close together, strengthening the nagging suspicion that Alinea is now in the pack-in-the-plebs stage of its existence. 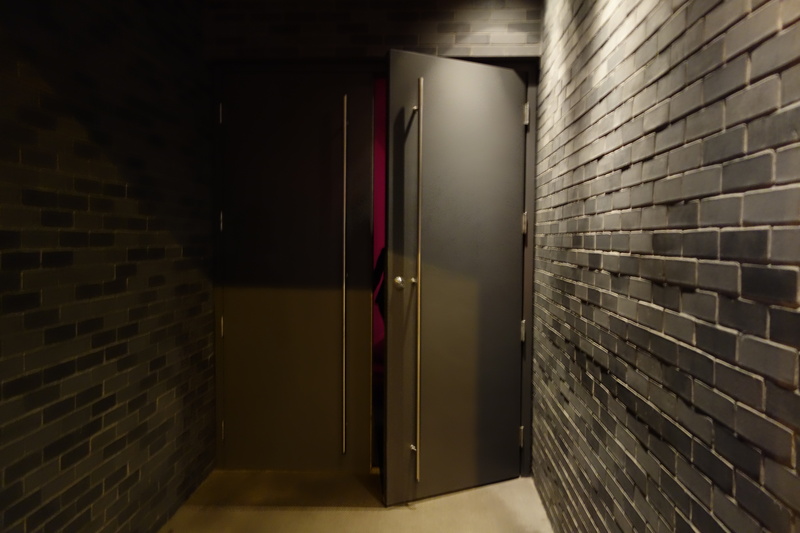 It doesn’t matter when there’s loud music like Schwa, but in a hushed gastronomic temple vibe like Alinea, the tables can be too uncomfortably close for conversation. (It reminded me of another bad offender, Restaurant Andre in Singapore.) 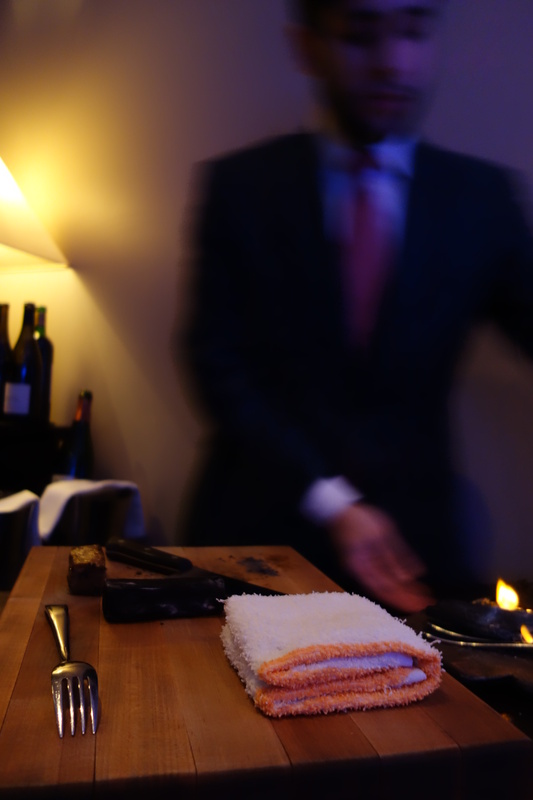 It didn’t afflict our table, but that’s because we were fairly experienced diners – but Alinea has a duty to its neophyte diners too. The two tables to my left were clearly special occasion tables, and they were uncomfortable with the table distance for their whole two hours, and spoke in hushed whispers. I felt for them – more personal space should have been given. Thirdly, and most importantly, the flavours were too safe. Peruvian food is fine, but if I wanted to eat straight up Peruvian I would go to a Peruvian restaurant. Duck with 60 pairings? I once made the terrible mistake in Prague of seasoning my own steak tartare, which came out a tasteless mingy meat-mash, instead of being a delicious glob of myoglobin. From that fiasco, I learnt that the genius of the chef is in his proportioning the dish just right. So proportioning the seasonings to my own duck came across to me as a gimmick. A orange-sweetbread in the style of Panda Express was simply awful. Deconstructed Indian food remained deconstructed and never came together. 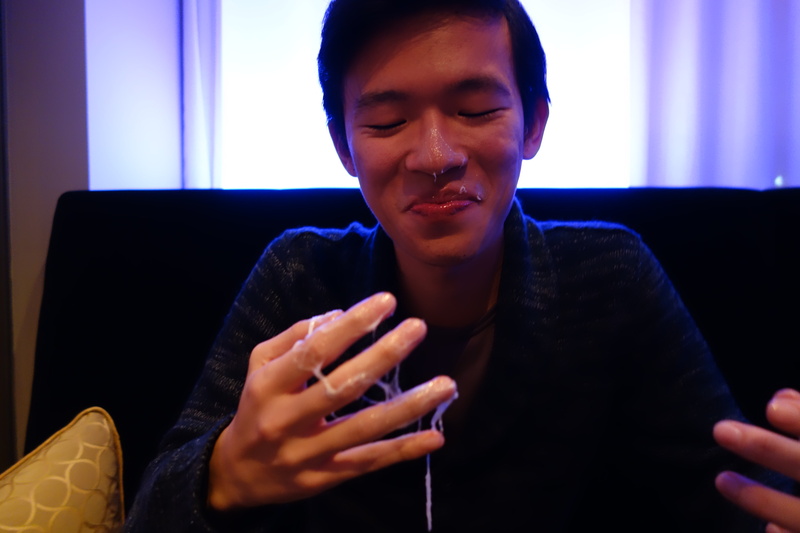 The highs were a rambutan and finger-lime (what is it with finger-limes and Chicago? I’ve had them twice in a row, and nowhere else) jelly dish, and the signature hot potato cold potato. But they were few and far between. 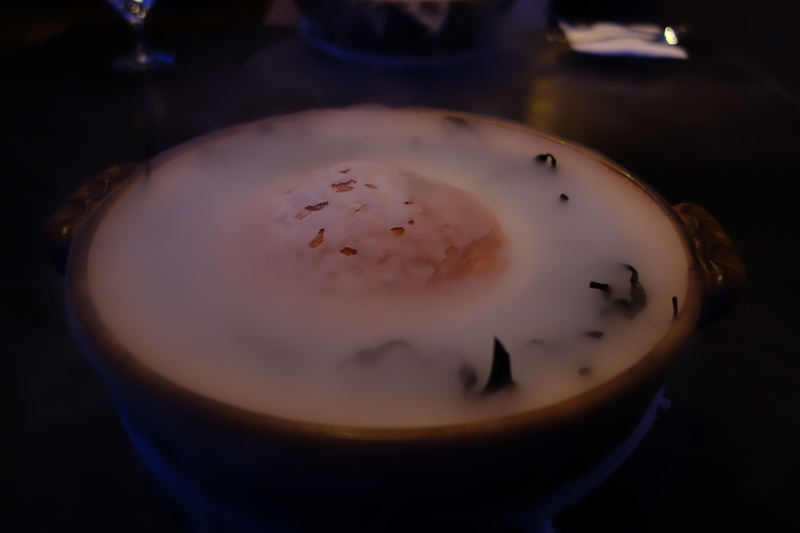 I came to Alinea because I heard that Grant Achatz was that rarest of chefs, someone who combined the molecular wizardry of Harry Potter food, with a sensitive understanding of flavor combinations. But rare glimpses aside (the rambutan dish), the tastes were big and one-dimensional, rarely emphasising interplay of two or god-forbid, three ingredients. In short, it felt like I was served merely Harry Potter food. 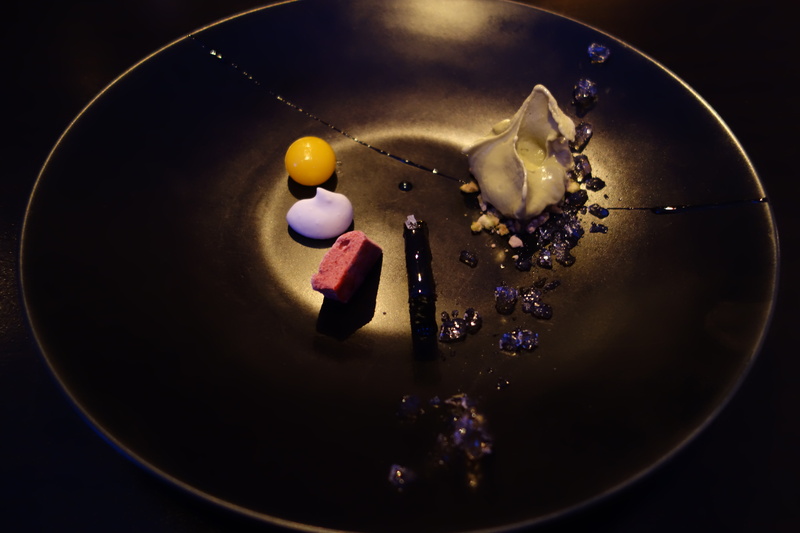 If Alinea continues turning out meals of this quality, it is hard to see how it can maintain three Michelin stars on merit for much longer. 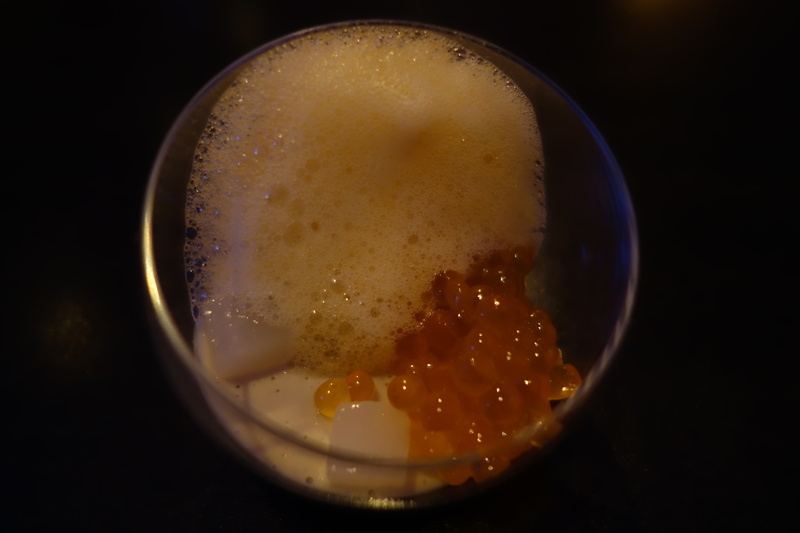 Banana cream and passionfruit foam, with roe of char (similar to “ikura”, except ikura is roe of salmon). 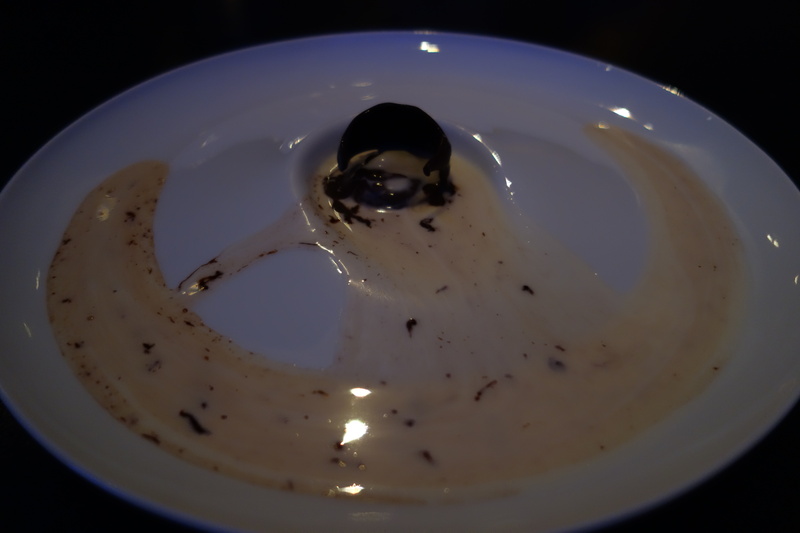 This was okay, primarily distinguished for the rocking bowl it was served in that thwarted a good picture of it for about 15 seconds. Yuzu, lemon grass and lemon verbena formed the hazy citrus aroma. 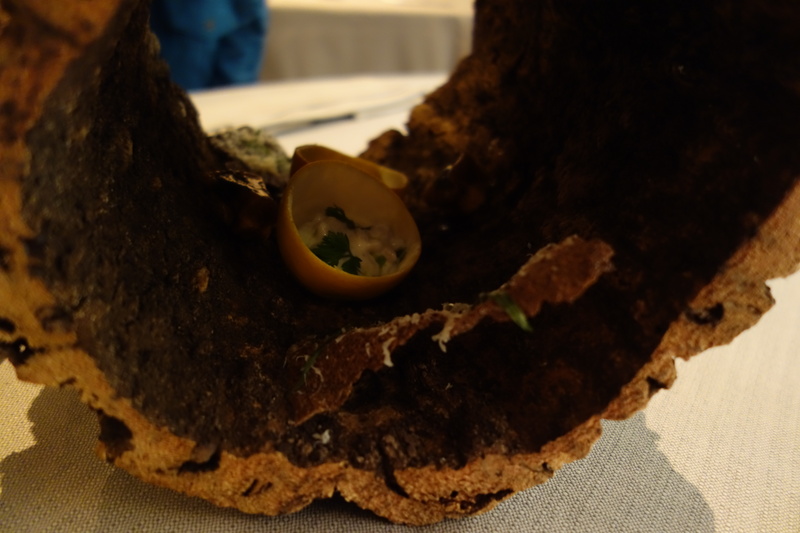 A very pretty pot and clam shell hid a carbonated ceviche sauce, with Maine diver scallop, and some onions. 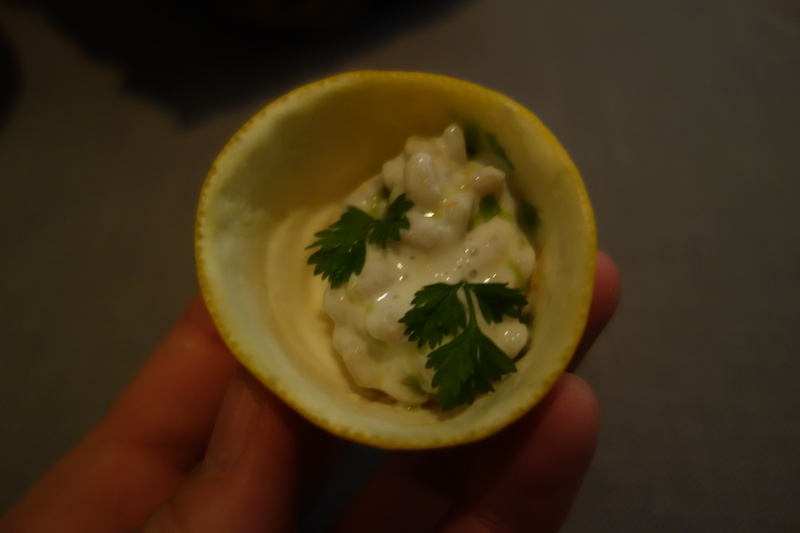 It was all told, simply Peruvian ceviche with Maine scallop. Not unpleasant, but unspectacular in substance. Maine scallop was more to be applauded for its bare fact of existence on our plates (this year’s Maine scallop catch has been low and some areas have prematurely ended their season by imposing moratoriums) than its taste, which lacked the sweetness of scallops I had recently in Momofuku Ko and Peru’s Maido and tasted more meaty than anything. A precursor to a future dish was also set down in front of us. 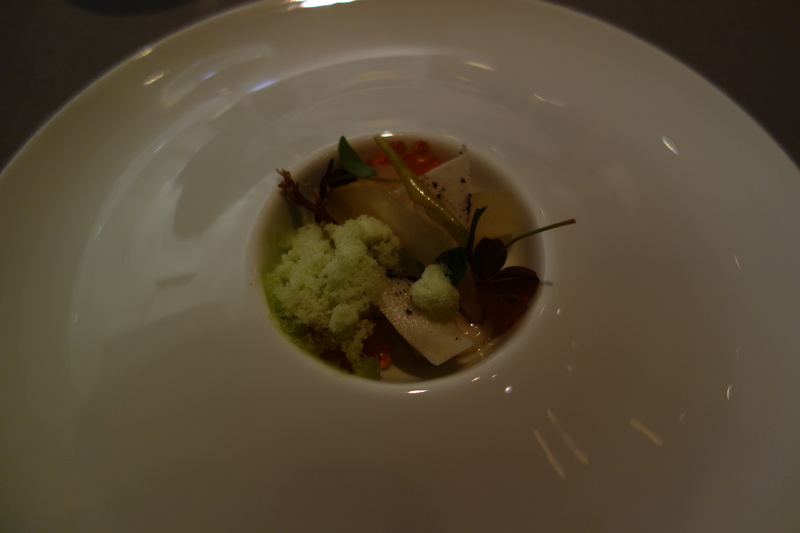 Most memorable for the clean taste of celtuce cubes (something like braised kai-lan, for Southeast Asian readers). Again, pleasant without being mindblowing. 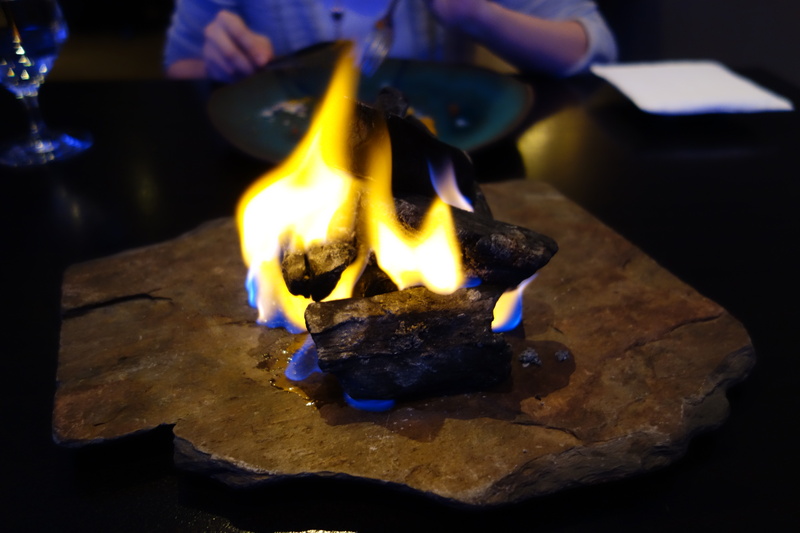 The precursor to the next dish was set on fire. 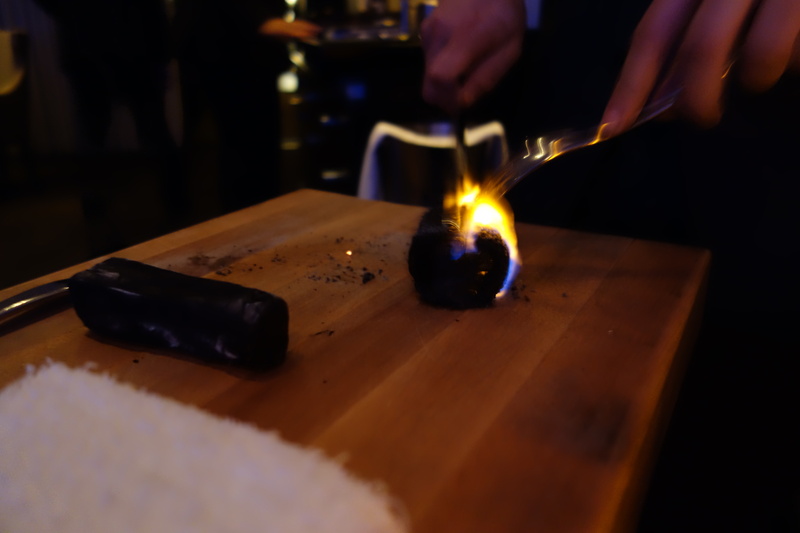 A5 wagyu is the highest grade of wagyu obtainable in the United States, it was precooked and for visual efffect roasted in a fire, along with roasted parsnip (tastes like carrot with the texture of ginseng) and a black trumpet puree, with a strip of (mushroom?) leather and (parsnip?) cream. This was not bad. The beef was a bit lukewarm, but I can’t complain given the long period where it was sitting in the fire, pretending to cook while actually cooling down. 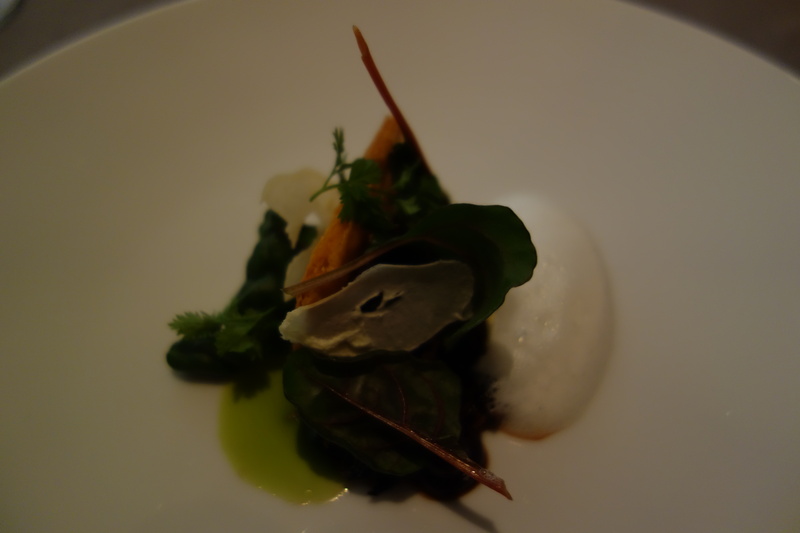 The first dish which I enjoyed for its sake alone, this was a palate cleansing dish after the rich wagyu. 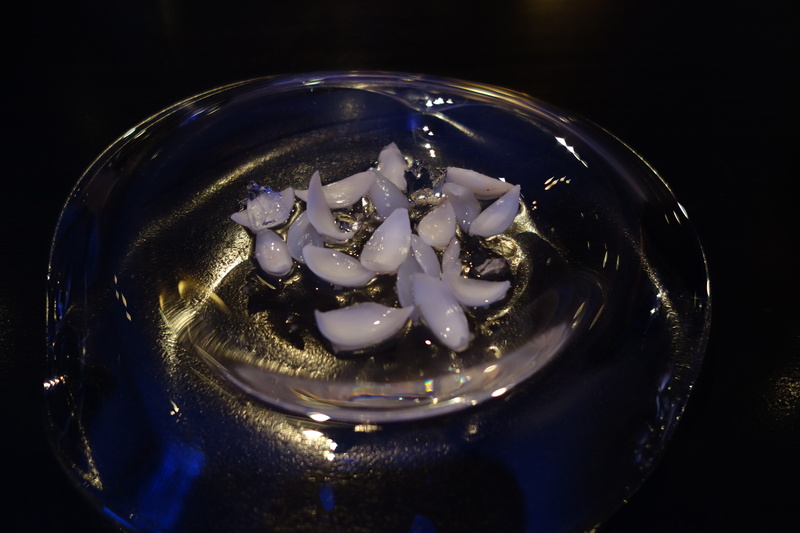 Slivers of lily bulb (bai he, an occasional ingredient in Cantonese cooking usually used for shrimp or vegetables), with shaved rambutan, and squeezed-out sacs (vesicles) of finger lime, and finger lime jelly, with a distilled syrup of finger lime and ginger. One advantage of using finger-lime, as I understand it, is that its vesicles or “citrus caviar” is easily squeezed out. This dish was vaguely Southeast Asian in provenance, combining the rambutan and lily bulb with the Australian finger lime. Very refreshing. Wood ear, or “mu er” in Chinese is a black fungus that has the texture of jellyfish – very similar to the European fungus jew’s ear. 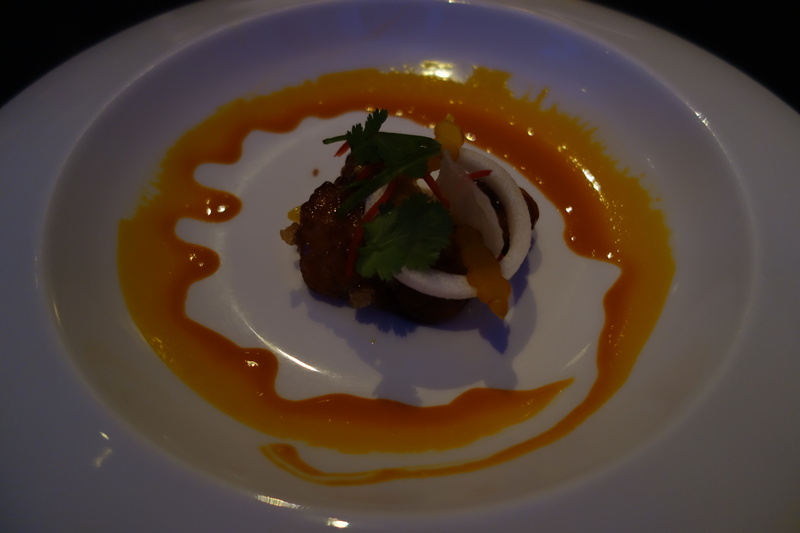 Here it was set with a deep fried pig’s ear (delicious, but can we have more than a single sliver? ), and black garlic and onion sauces made savory with parmesan. What was interesting to this Chinese palate was the pig’s ear, which was really expertly fried. 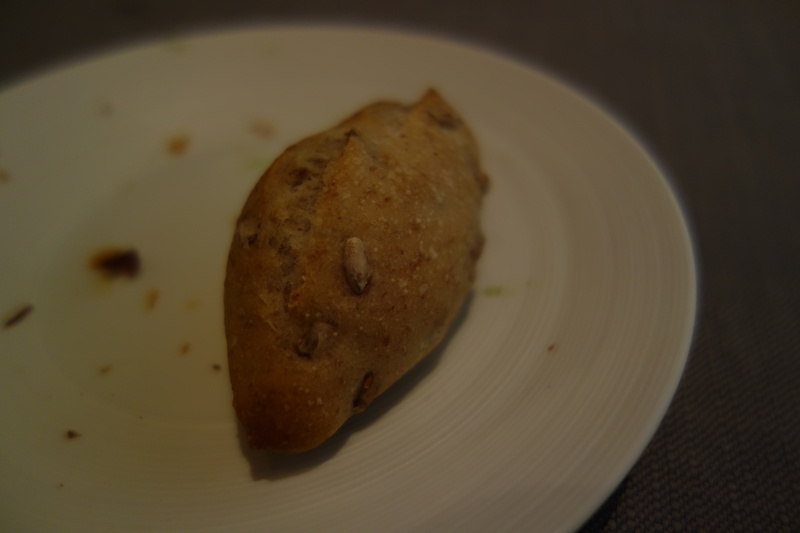 At this point of the meal, I sensed a disconnect – perhaps this sort of “world cuisine” could have been mindblowing to someone who had not been eating wood ear and pig’s ear since childhood. 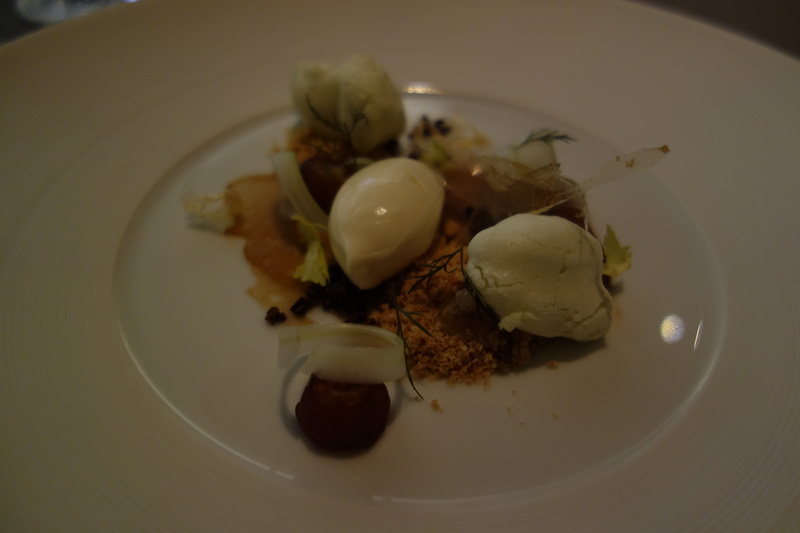 Perhaps the novelty of the rambutan dish would have been starker if I wasn’t intimately familiar with all ingredients. The ceviche dish I might have considered top class, if I hadn’t been to Peru the month before, and tried ceviche ten different ways. 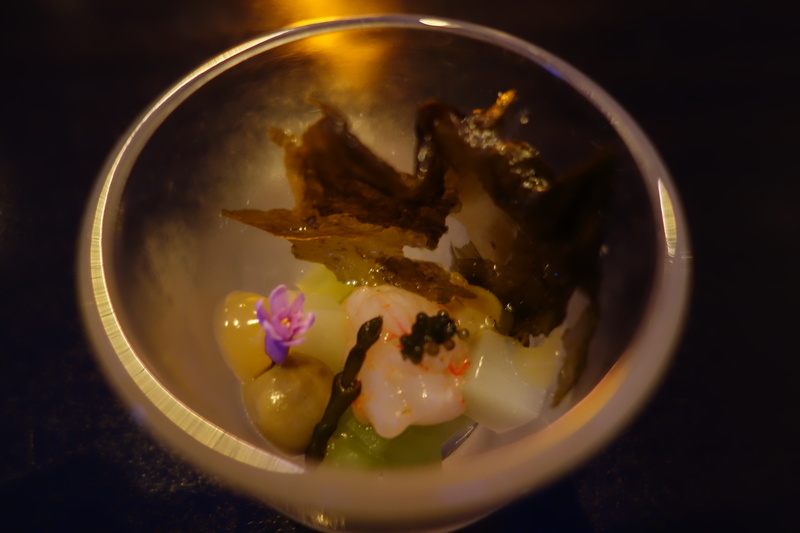 To this Southeast Asian Chinese diner, Alinea’s Chinese-inspired dishes were solid but not mindblowing. Similarly to a Peruvian traveller, that Peruvian dish would be merely solid. 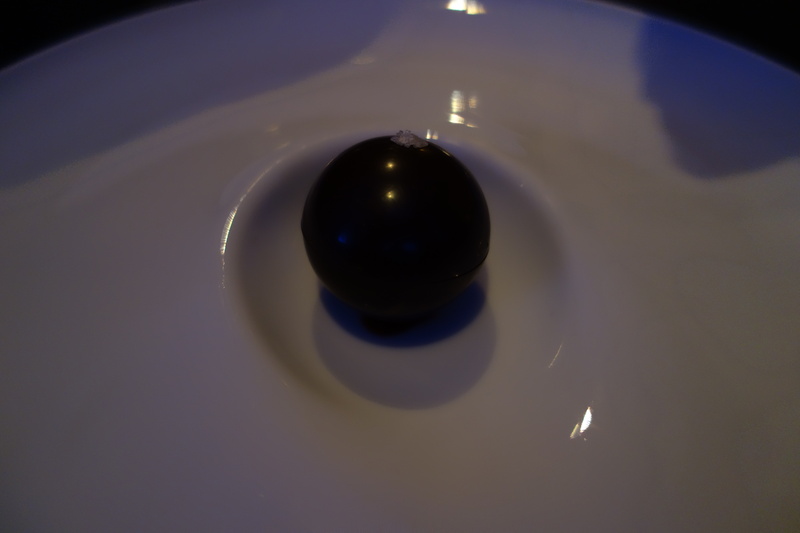 This Alinea signature was luxuriantly rich, a hot sphere of Yukon potato topped with a slice of black truffle and butter and Parmesan cheese, into a cold truffle soup. A pin preserves the temperature of the individual ingredients, before being dropped into the soup. Time-sensitive, and every bit as good as people claim it to be. 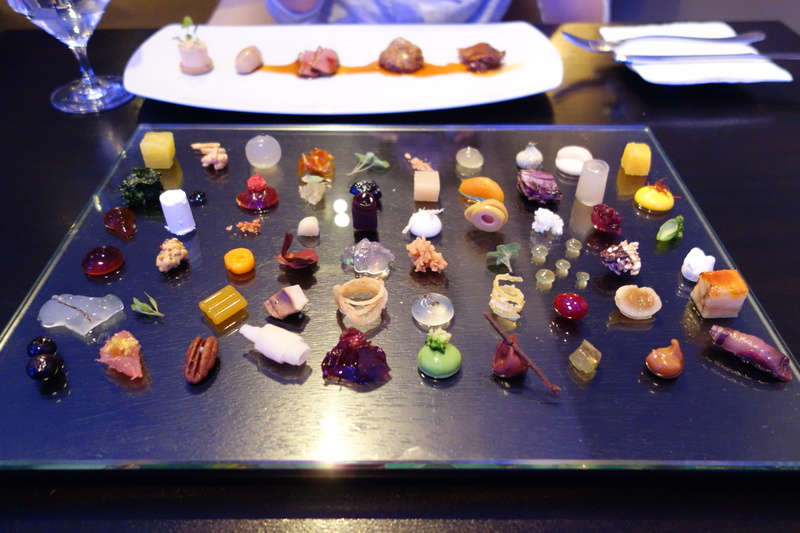 60 different garnishes for 5 different preparations of duck. I think there was roast, confit, foie gras with a graham cracker base. “Choose your own adventure” with the toppings, the servers advised. As I said above, the genius of the chef is in his proportioning the dish just right. So proportioning the seasonings to my own duck came across to me as a gimmick. All parts were well prepared, but this dish was clearly an effect dish, rather than a tribute to the vision and taste of a single chef. A pleasant dish of pistachio gelato, marscapone, lemon gel sphere, Missouri-black-walnut chocolate cake, and dehydrated strawberry marshmallow. Good, solid. Hehehe. 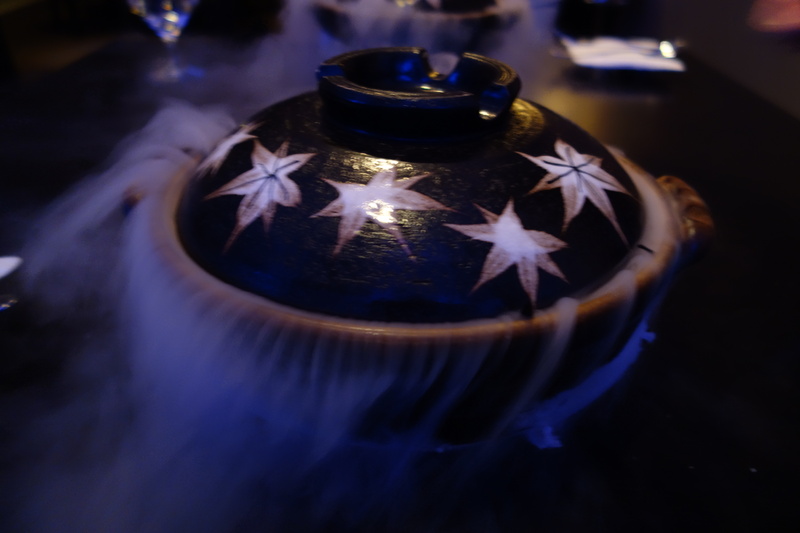 Finally, an effect dish that is so one-of-a-kind it makes the experience of dining at Alinea worth it! 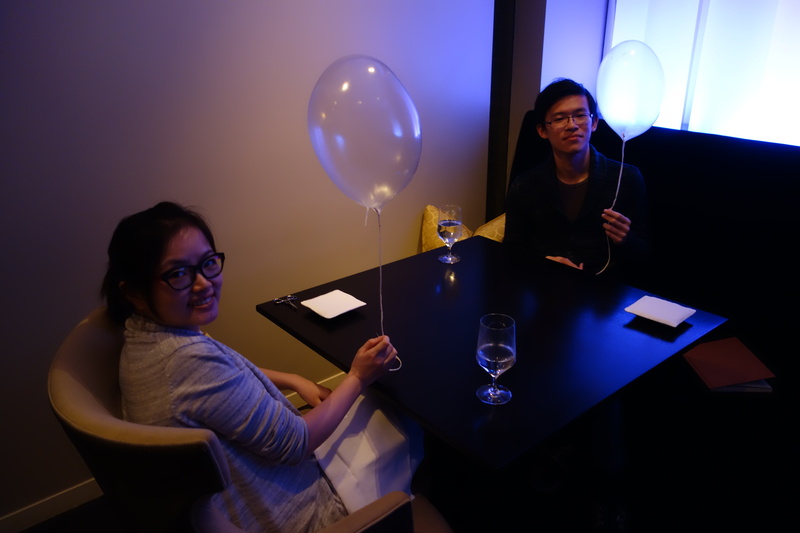 Another Alinea signature – the green apple balloon is filled with Helium and brought to diners anchored to a pin. Diners bring their mouths to the balloon, and gently… kiss it, sucking out the helium and making funny noises. It’s a riot. Also very messy. 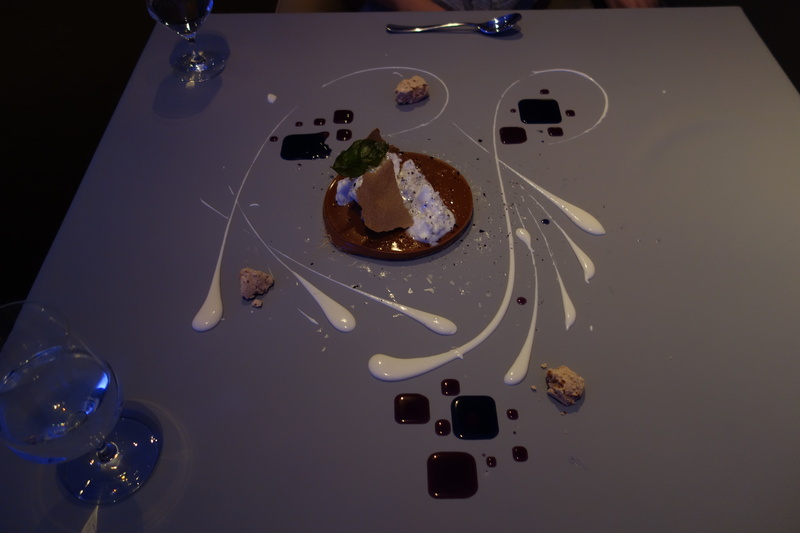 Another Alinea signature technique: a dessert is plated on a whole table, covered with a silicon mat. A chef plates it in two minutes. 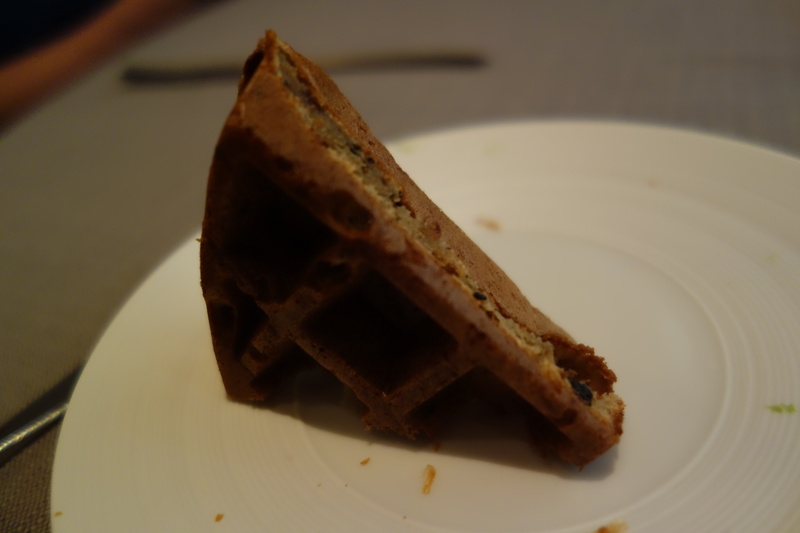 The milk chocolate and frozen milk had a bit of a sour tinge that didn’t appeal to me, though the pate sucrees (very similar to kueh bangkit or Bengawan Solo’s nut pastries, for Southeast Asian readers) was the best part of the dish. Notes on visual effects: The squares come from micro-protrusions in the silicon tablecloth, which the violet syrup would settle into a square if it’s the right viscosity. The colour change of certain squares to blue uses a natural pH indicator, the squares of which are added citric acid, I think. Sadly you might have noticed a trend there. 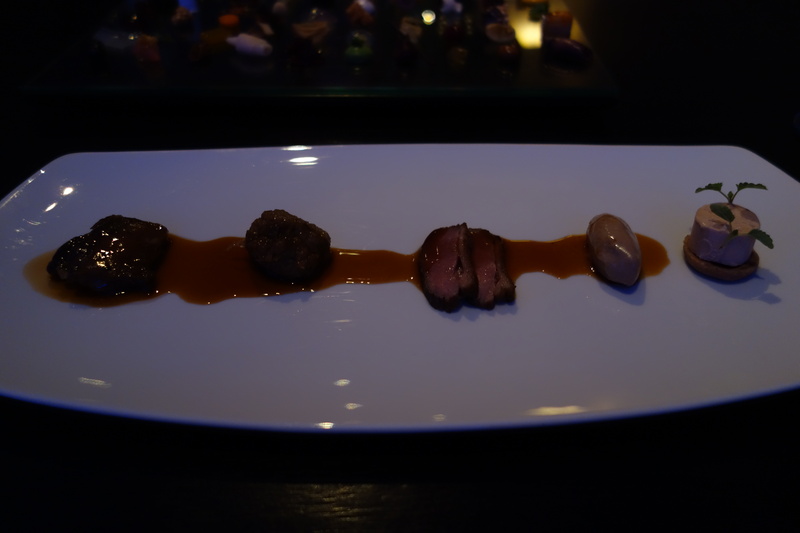 My first four Alinea dinners remain among my several meals ever but recently I had a fairly disappointing experience. My meal lasted barely over two hours (prior meals were nearly four), service not as attentive or friendly as with prior visits. 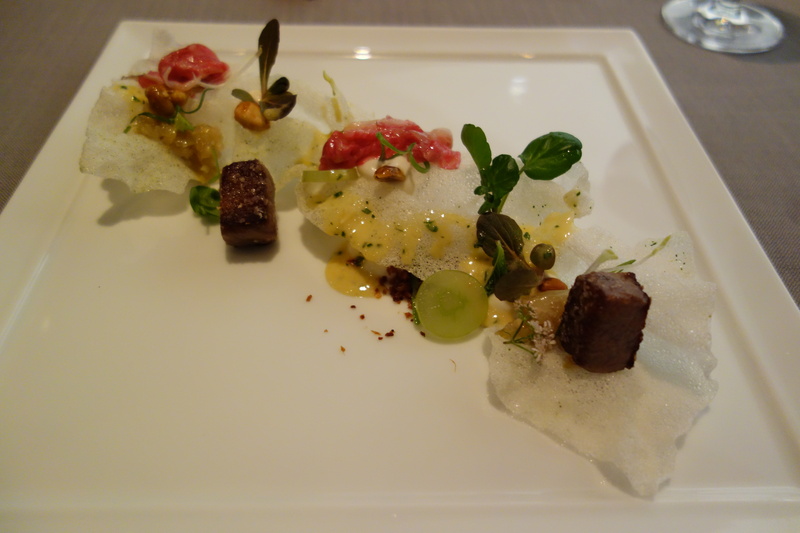 Also some amateur mistakes were made, such as we were twice asked if we needed a cab, both times said “no” and as we were leaving were informed our cab was waiting (not something you expect from a three Michelin star venue regarded as one of the world’s best). While some of the courses were memorable and phenomenal (loved the scallop course and the corn dessert) and a couple other quite good, a majority of the menu was no different (or only tweaked) from my last visit nearly a year back (and a few unchanged from my first meal there – including a rather boring, uninspired ginger course that is fine once but weak as a repeat and ridiculous the fifth time). Chef Achatz has been spending less time in house (turning a lot of the creative and executive duties to Chef Bagale), they lost some wonderful front of house staff and Achatz/Kokonas seem as though they have placed expansion of their brand and maximizing profits ahead of customer satisfaction and trying to continue having Alinea evolve and improve. To an extent they seem to be coasting on their reputation and past success (which can only carry you for so long). While I hope this is just a hiccup in Alinea’s lifespan and Achatz and company rise to the challenge and opt to make another push towards Alinea becoming the world’s best restaurant (they certainly have the talent), unfortunately Alinea may be past her prime and Grace very well could become widely regarded as Chicago’s top venue in the not too distant future. 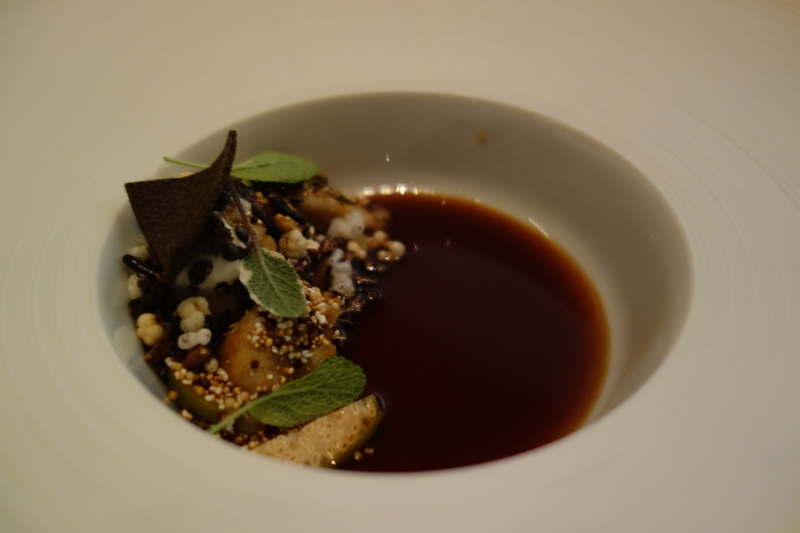 I found my last dining experience at Alinea to be a very poor value – especially if you have dined there within eighteen months and are expecting a significantly different menu rather than a watered down version of what you previously consumed with a handful of new courses interspersed. Several fine dining venues just in Chicago now have better service (Grace and Boka really shine in this area), most undergo significant menu changes seasonally (Grace, Moto, Boka, El Ideas, Sixteen, Elizabeth for example) and Grace and Goosefoot have IMHO better tasting food (with others such as Moto, El Ideas, Schwa, L2O, Boka and Elizabeth serving nearly as good cuisine). All of these venues are less money (some considerably so) and aside from Elizabeth do not require the hassle of non-refundable tickets (and Elizabeth does have some flexibility with regards to tickets sales if a conflict arises). 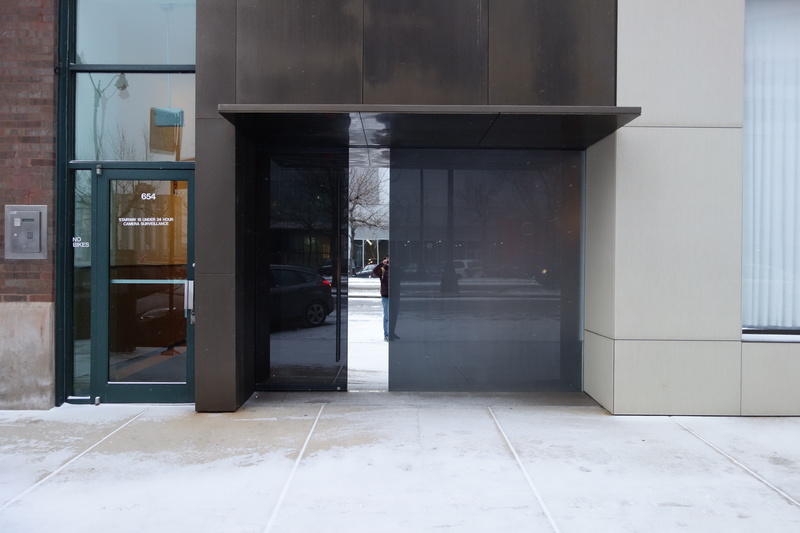 I hope that this ultimately disappointing visit to Alinea is a hiccup, and the Alinea that stood head-over-shoulders over all other restaurants in Chicago will return. Until then, it is doubtful I will revisit any time soon. 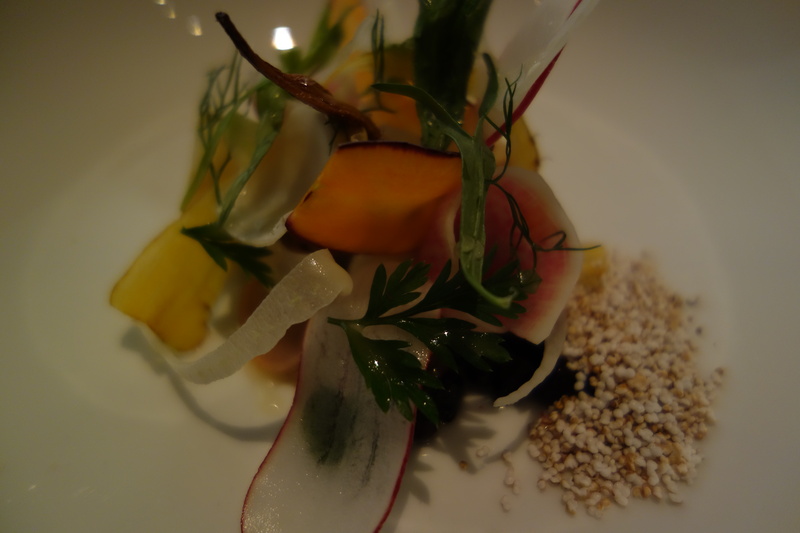 Great photography from the Gastronomer.